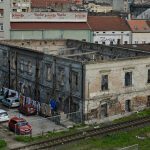 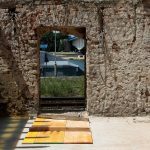 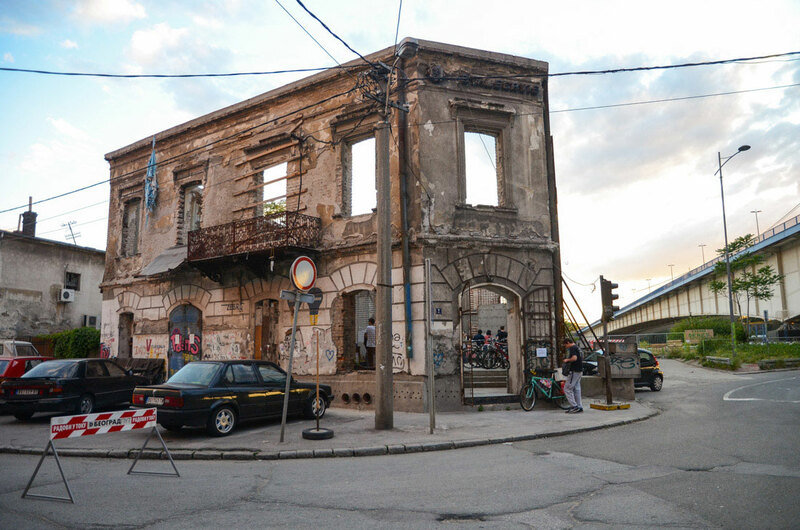 The Spanish House is a dilapidated building in Savamala, which after attempts at renovation and reconstruction was left unfinished. 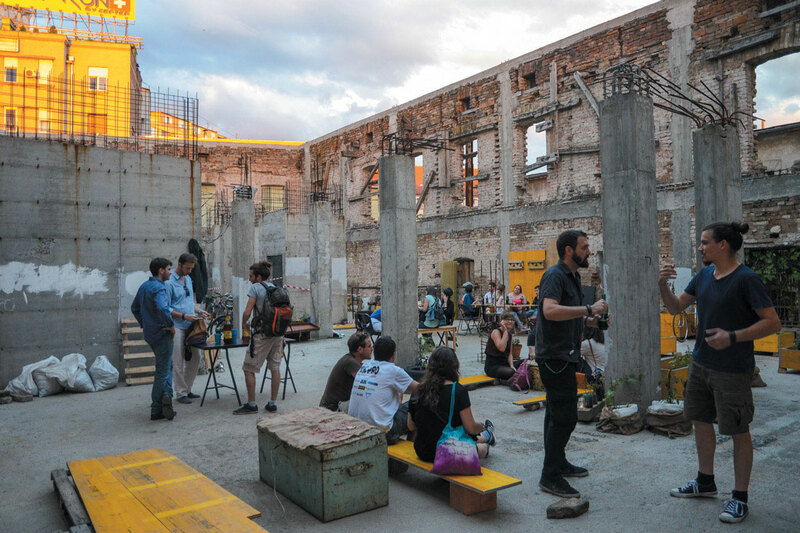 This seemingly useless investor´s ruin was from 2013 till 2016 transformed into a public space, community garden and central space for events organized by several projects within the Urban Incubator. 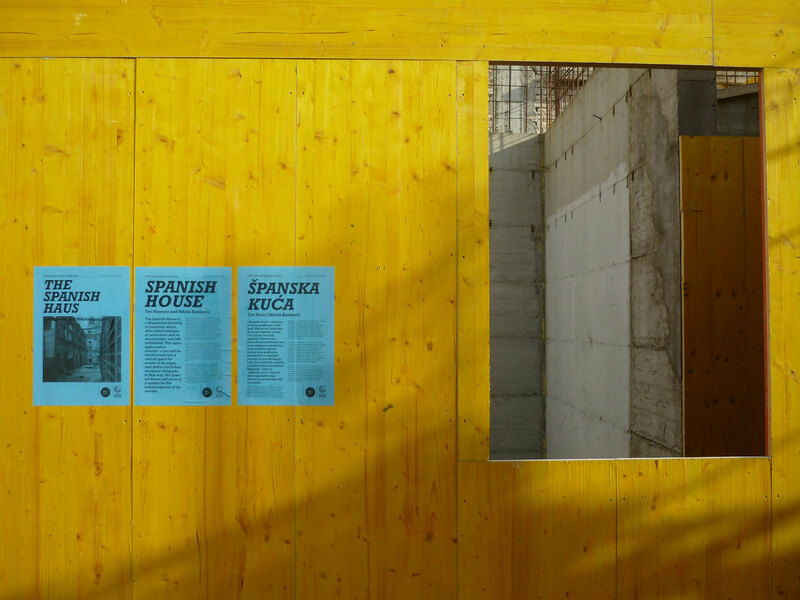 The Spanish House stands on the bank of the Sava River in Savamala, in the center of Belgrade. 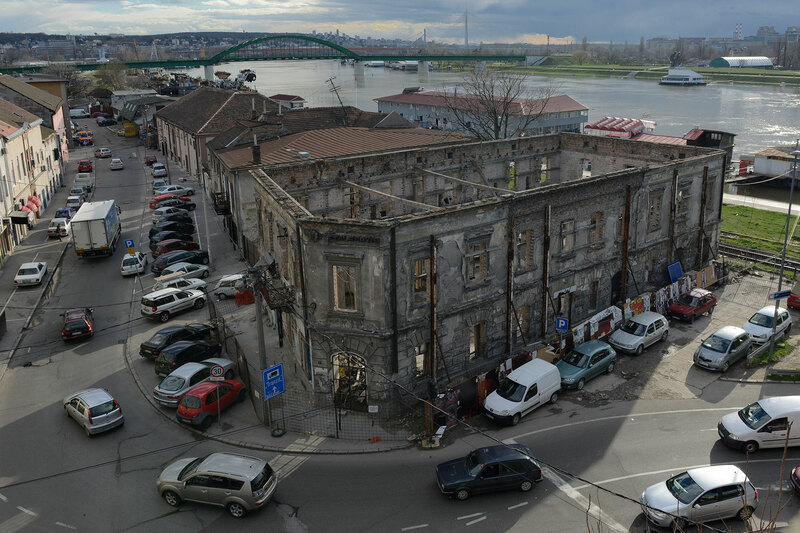 Savamala, the former fishing village was in the XVIII and XIX century called Bara Venecija (“Venice Pond”) due to the frequent floods. 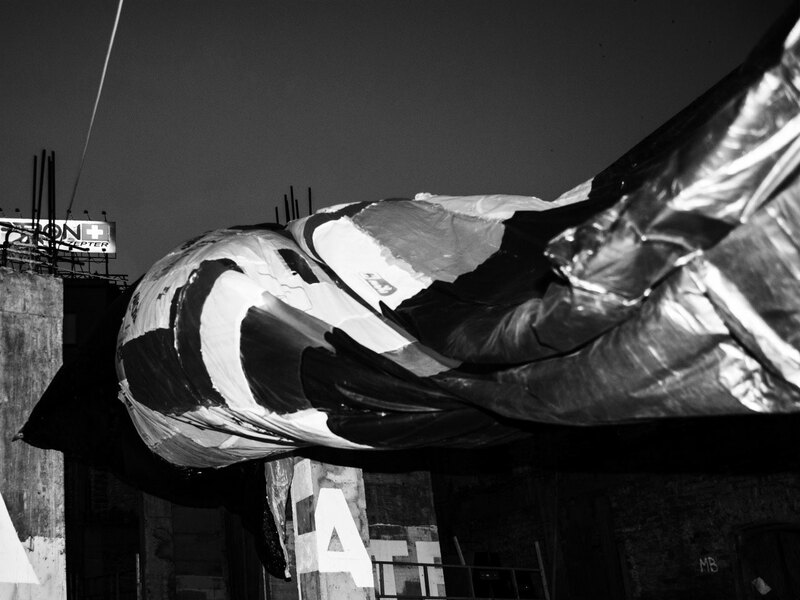 In those days, the inhabitants got around in small fishing boats. 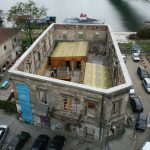 Before World War II, the Spanish House was a customs house, used by the port authorities. 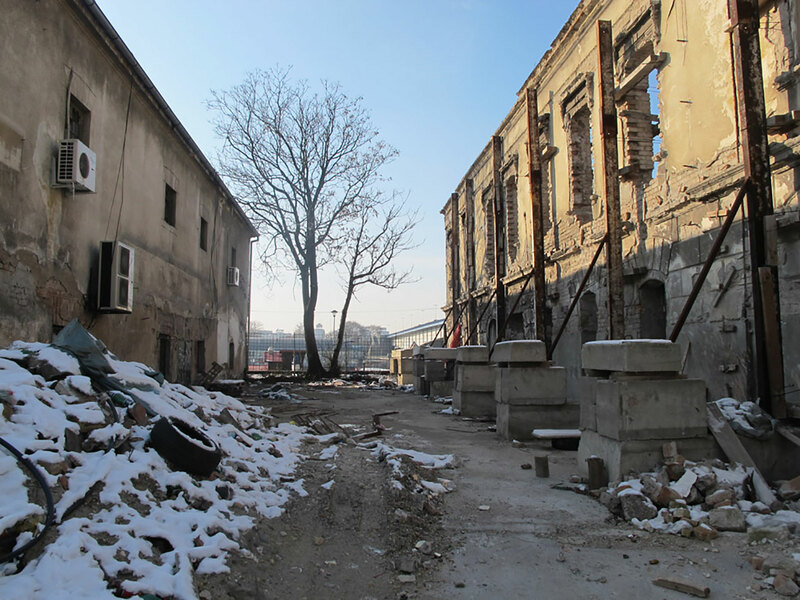 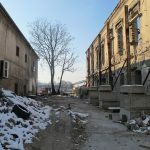 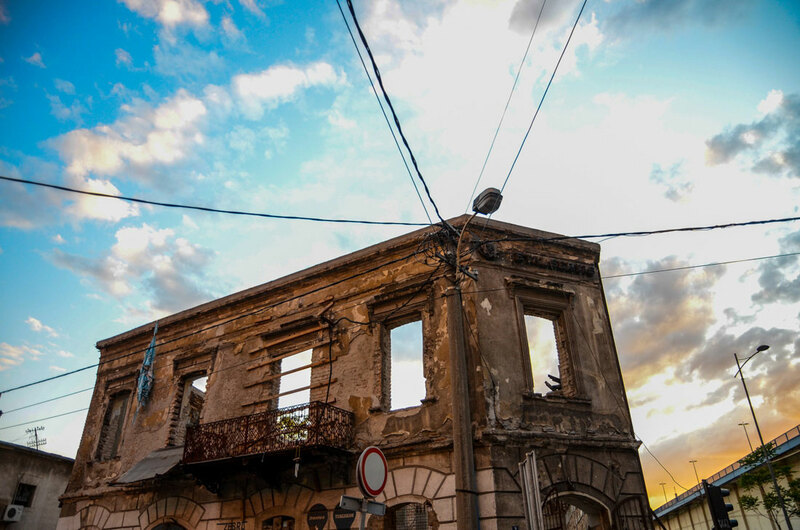 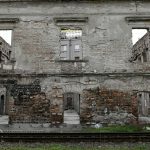 In the years after the war, the architectural fabric of Savamala has suffered greatly from increased traffic levels, and many buildings have fallen into disrepair. 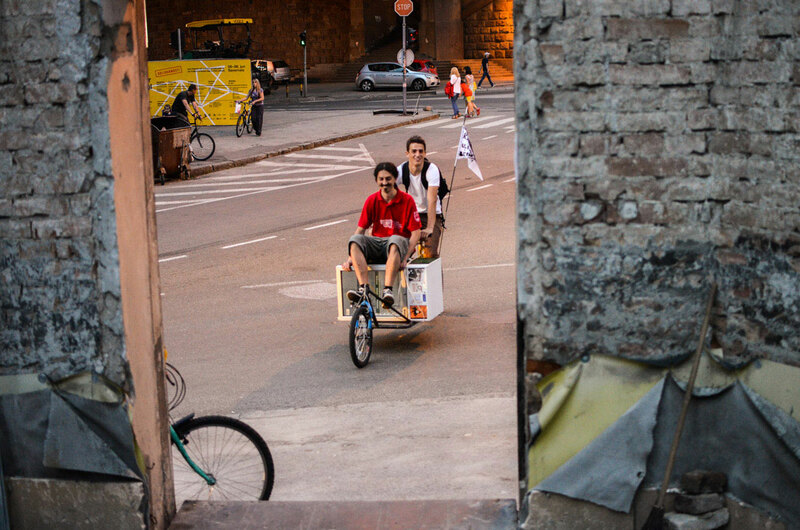 Heavy car and truck traffic remains a dominant element in the urban landscape. 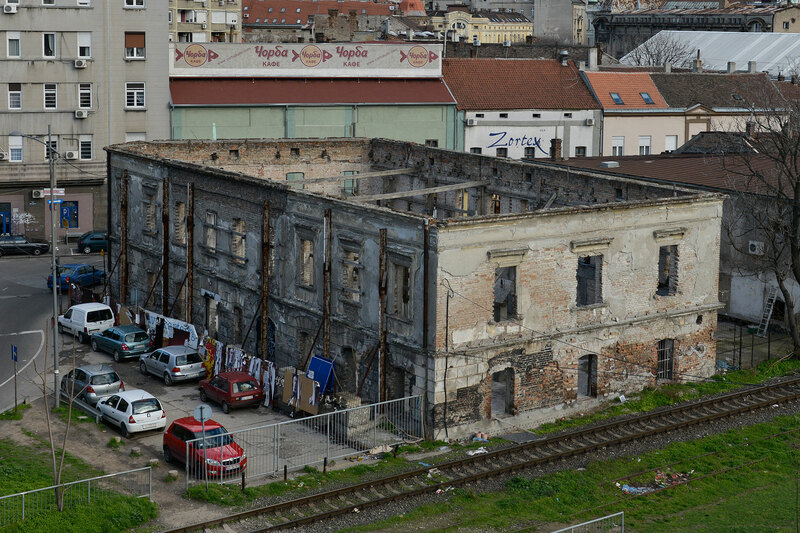 A rail line, still in use, runs directly through Savamala to the edge of the Sava River. 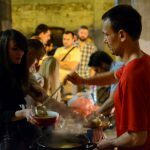 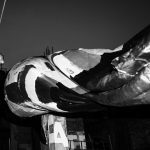 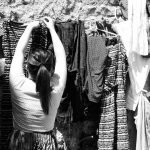 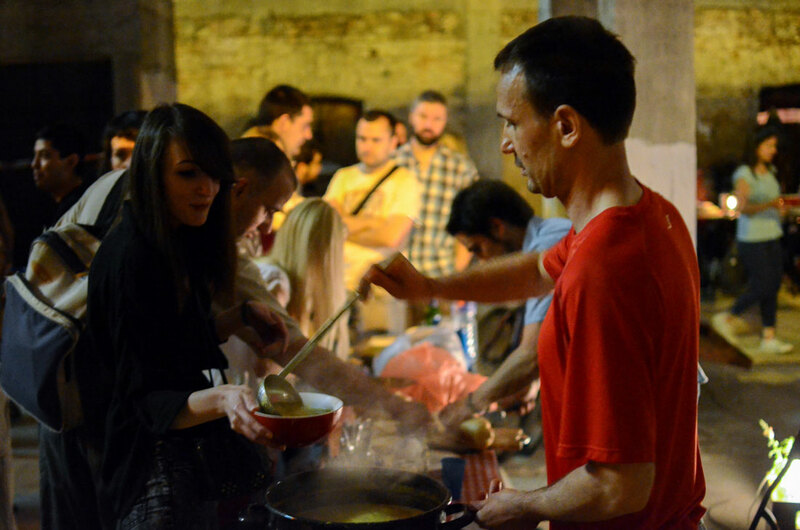 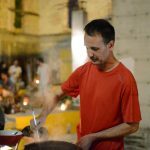 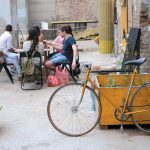 In the past six years, from 2009 till 2015 Savamala has developed into a district that sleeps by day and comes alive at night. 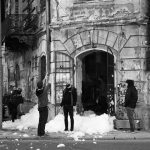 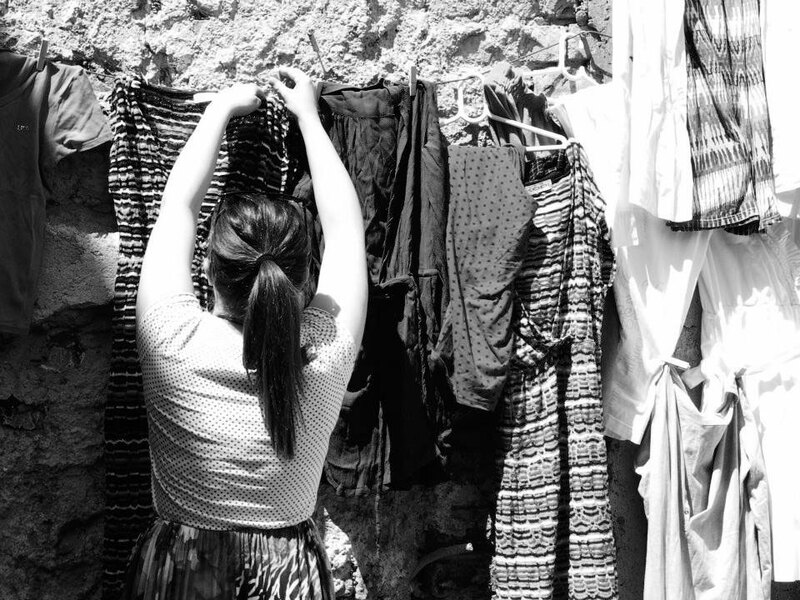 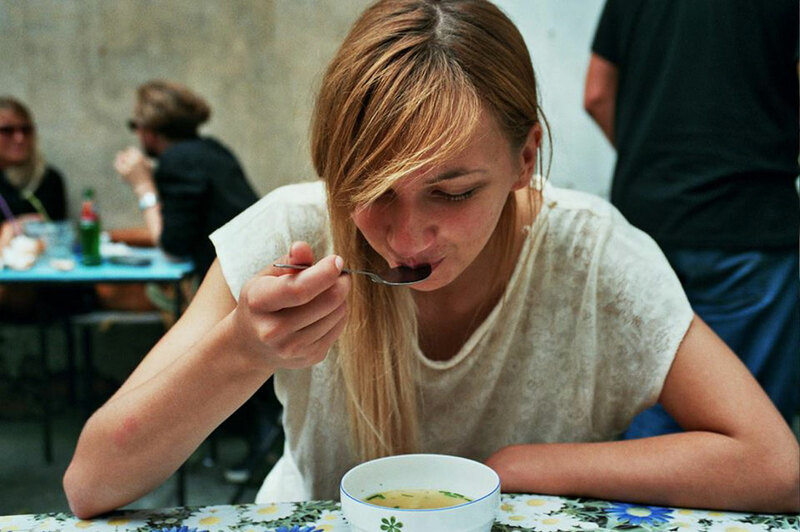 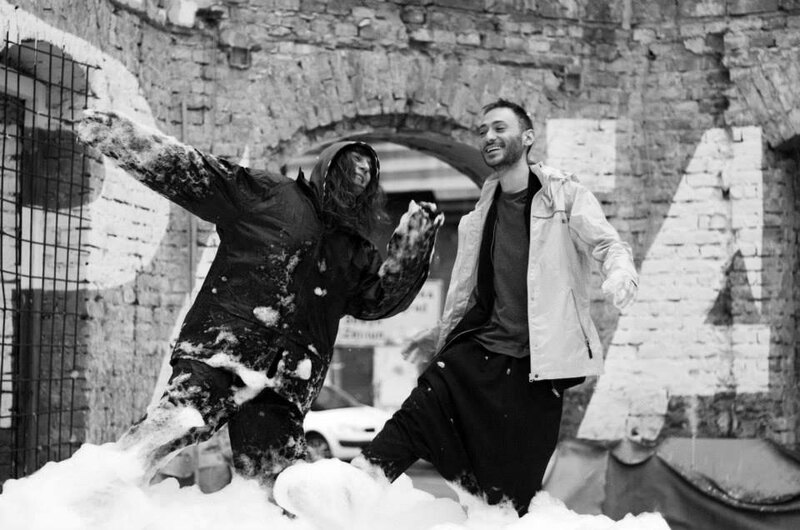 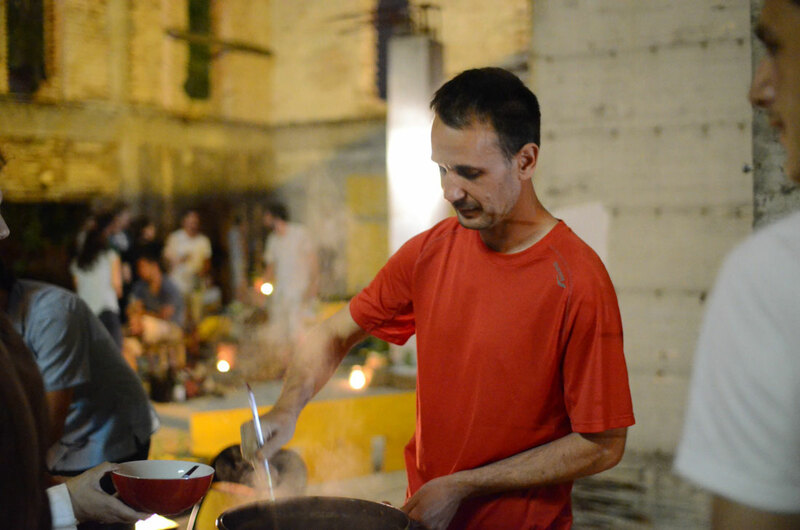 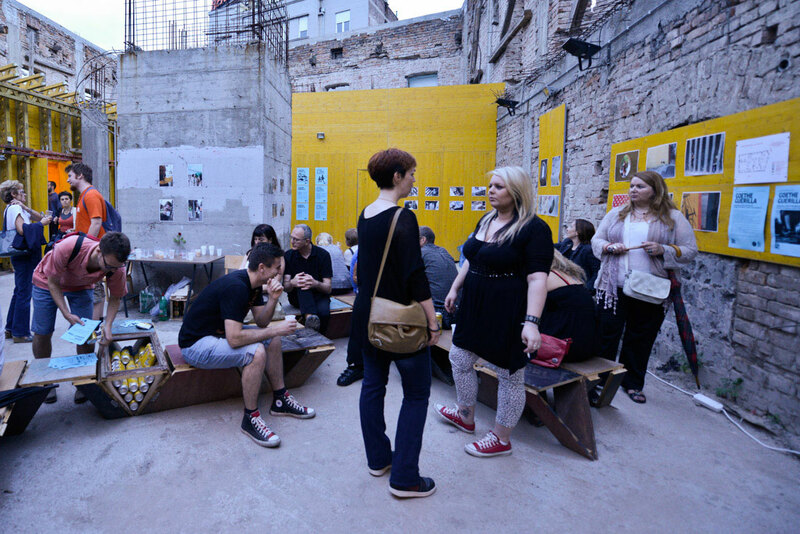 The KC GRAD culture center opened in 2009, followed by Mikser House in 2012 – two local institutions that have largely shaped Savamala’s creative scene. 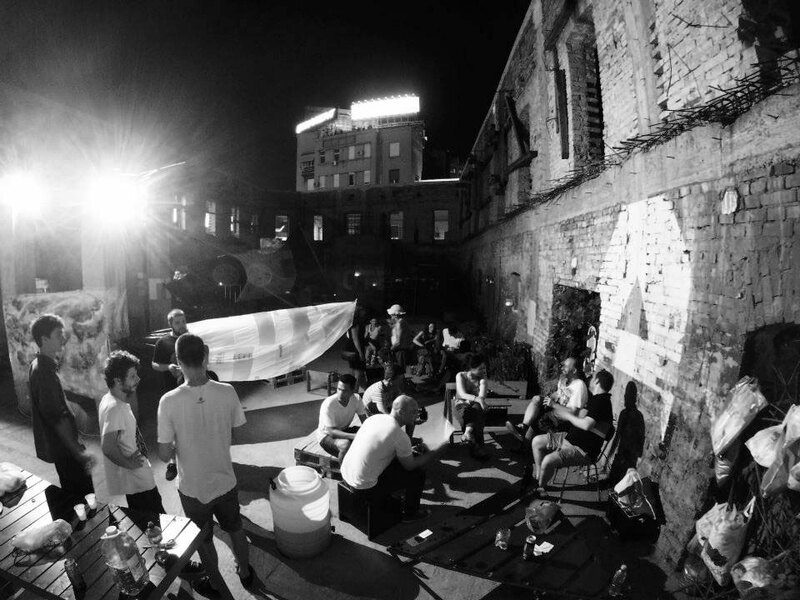 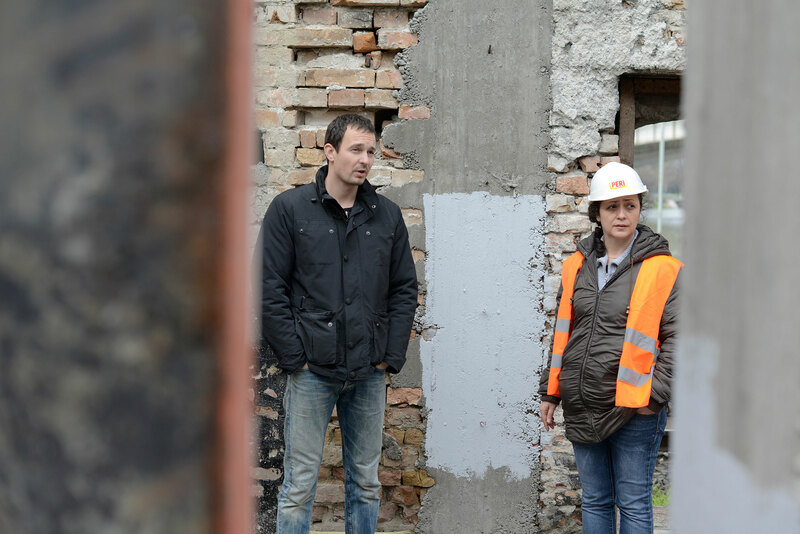 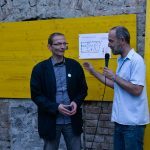 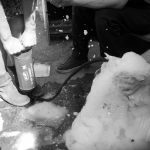 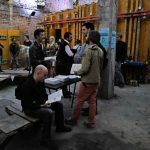 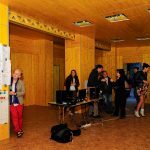 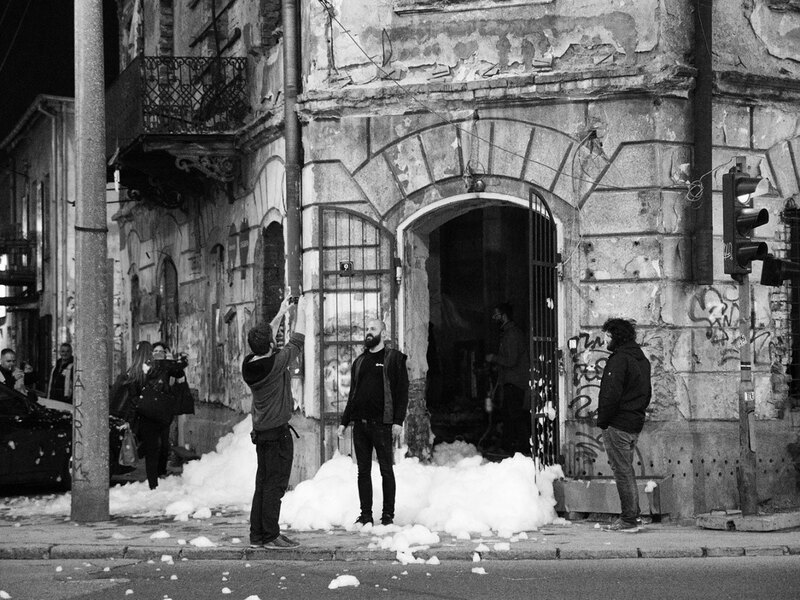 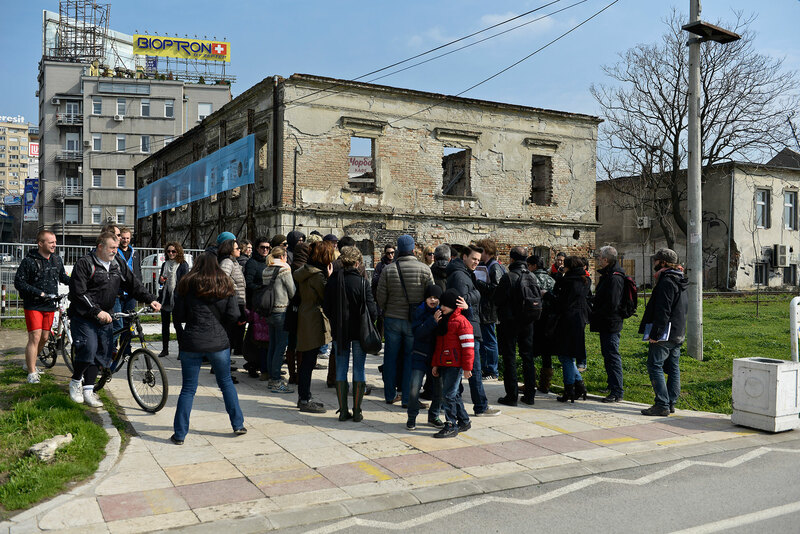 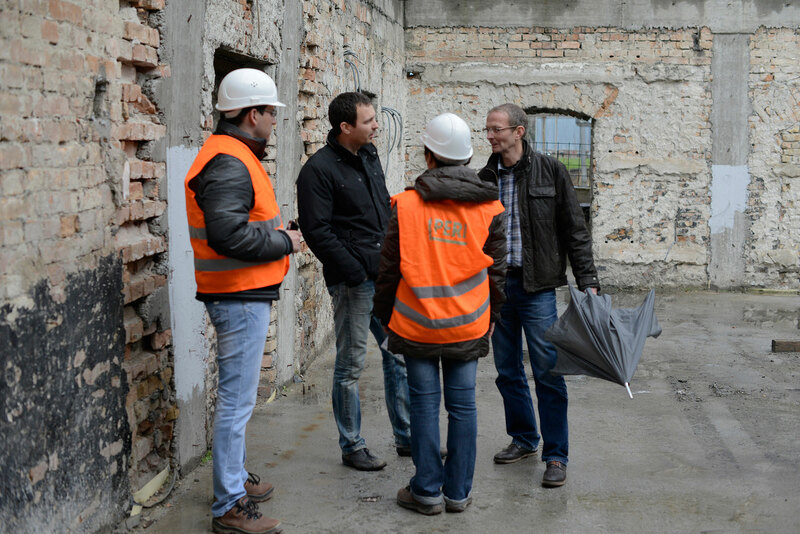 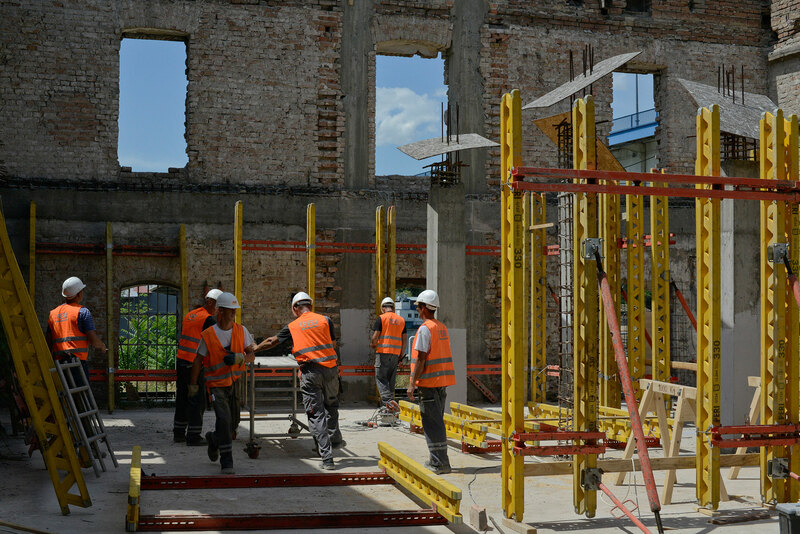 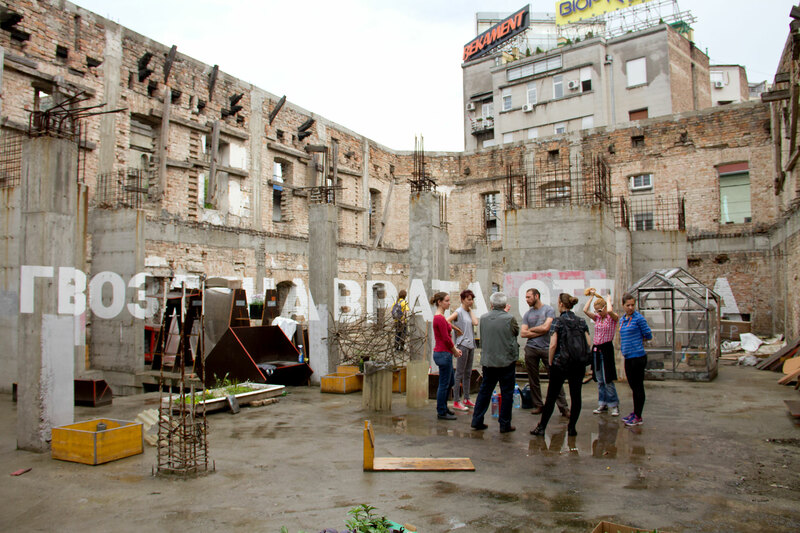 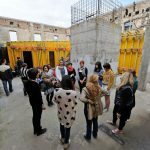 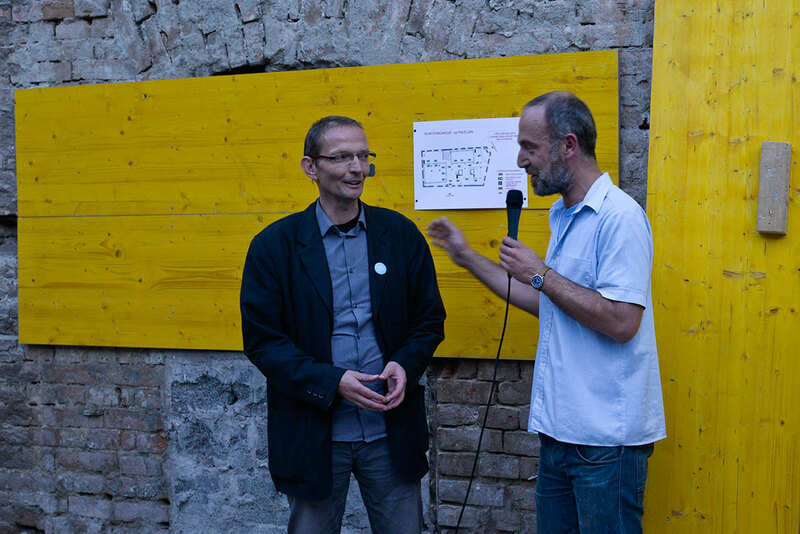 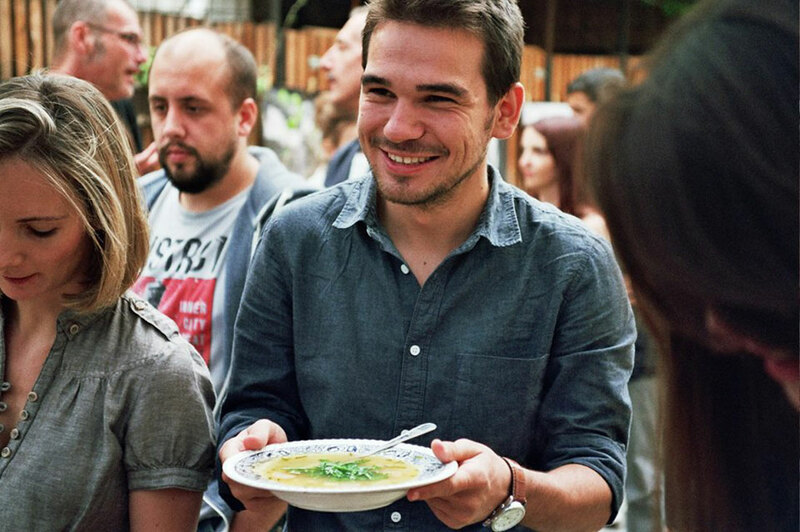 At the same time Mikser House was starting up, the Goethe-Institut was independently beginning preparations for the Urban Incubator Belgrade project in Savamala. 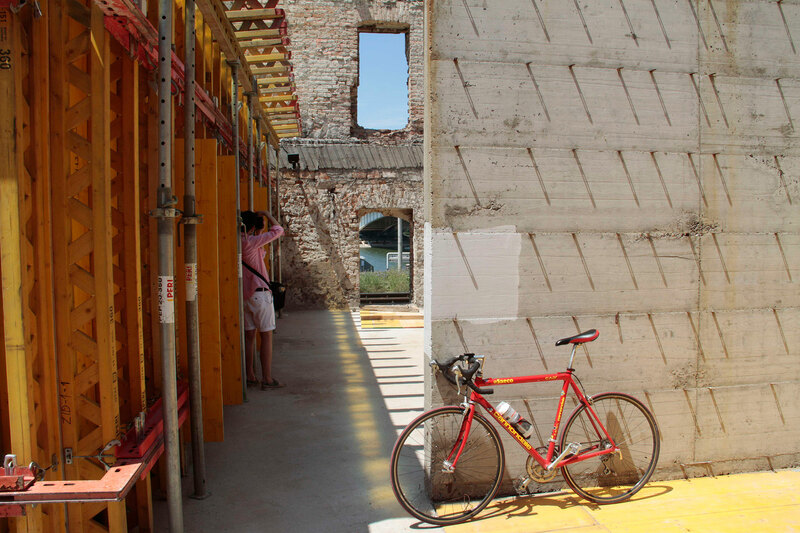 The 350-square-meter Spanish House had long stood empty. 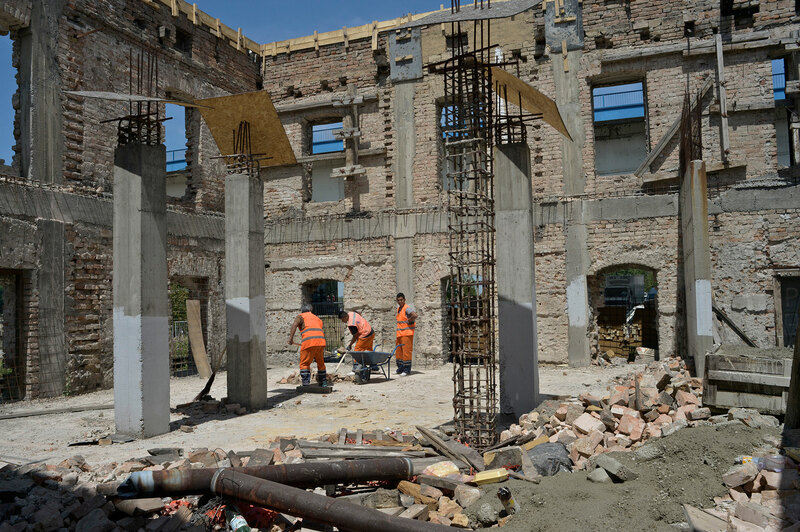 Construction projects had been planned and initiated but never completed. 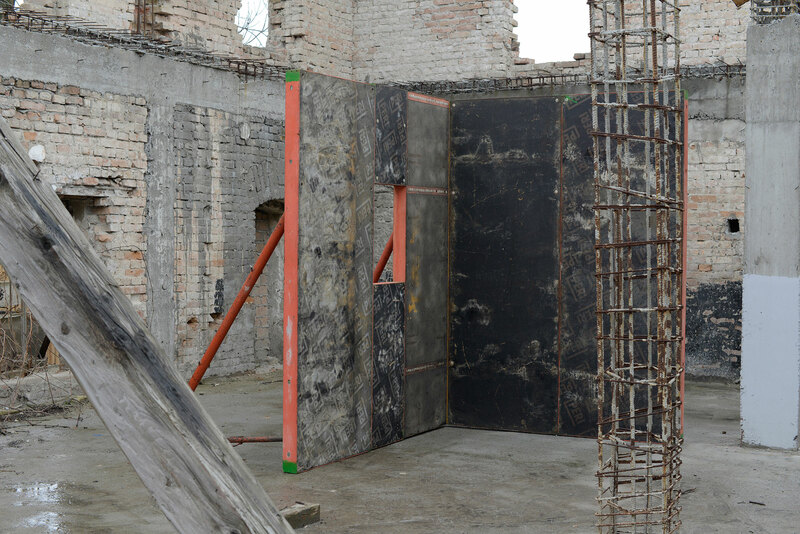 The building currently consists of the old exterior wall, a cellar and a ground floor. 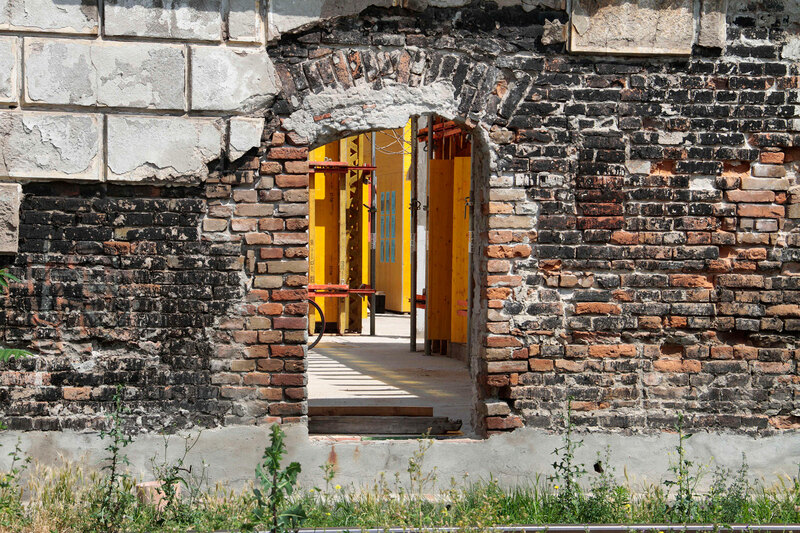 The old facade is held up by large metal supports, the window openings boarded up with strips of lath or blocked off with makeshift grates of rusty rebar. 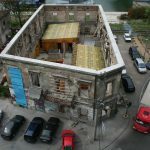 The roof is completely gone. 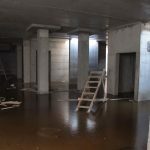 Also, the cellar is full of water, and the building is not connected to the public water supply. 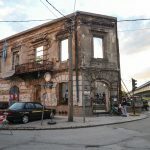 The Spanish House is a historic customs house, built around 1880 and has been in a dilapidated condition since early 80´s. 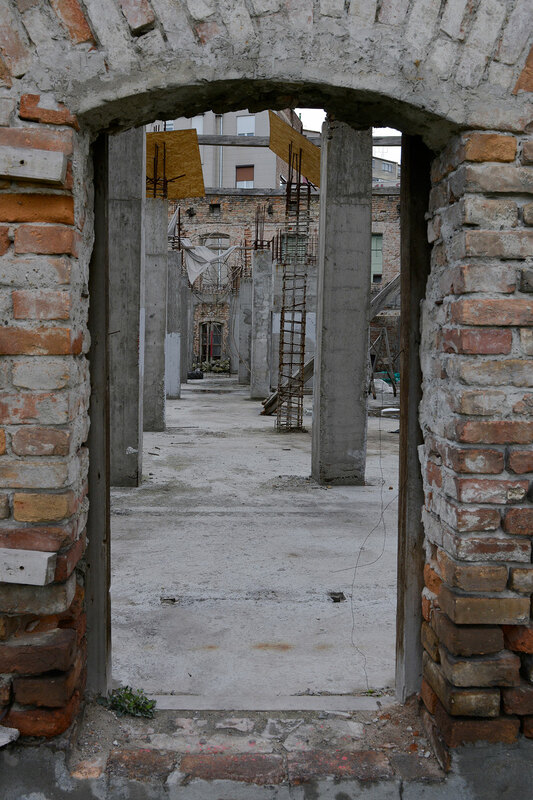 In 2005 after the introduction of free market reforms, a private investor intended to turn the building into a hotel. 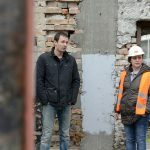 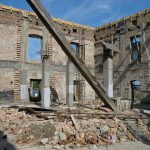 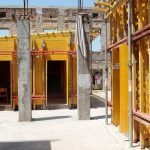 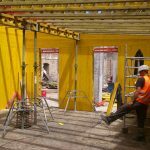 Due to financial problems the investor had to withdraw from the project after the building had already been gutted and partially reconstructed. 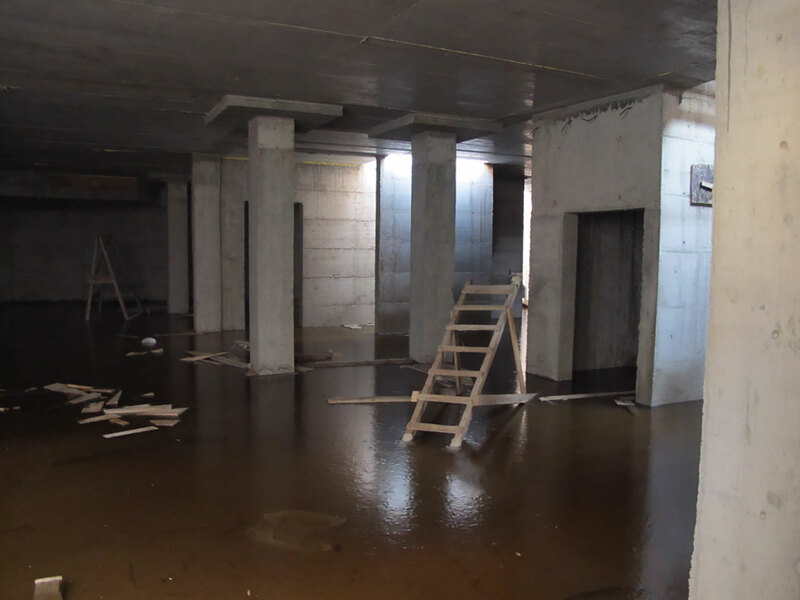 The windows and roof were removed and the first floor was built, separating the flooded basement from the street level. 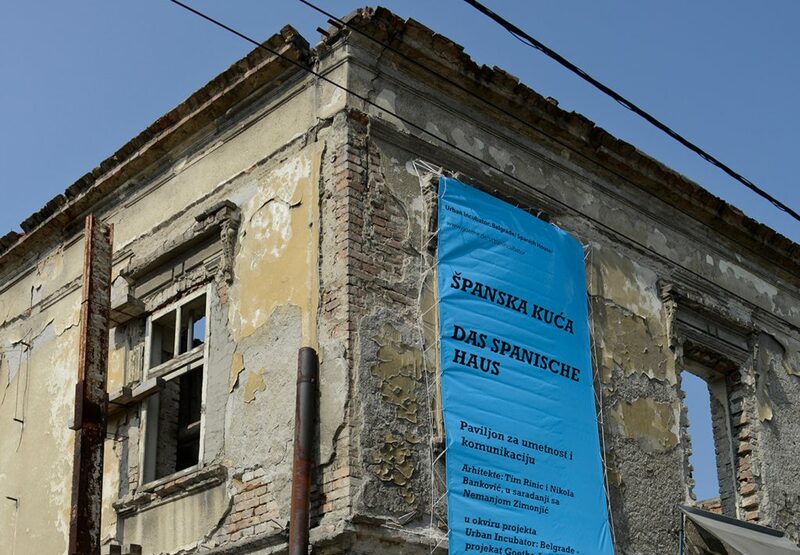 The name Spanish House comes from the urban legend about the Spanish traders in Belgrade. 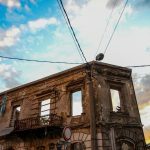 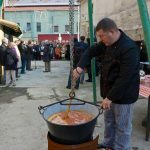 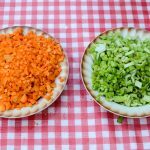 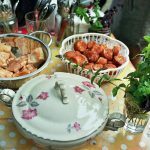 The House is located in Savamala district next to the Branko Bridge and it shares a garden with KC Grad, a cultural pioneer of the Neighborhood. 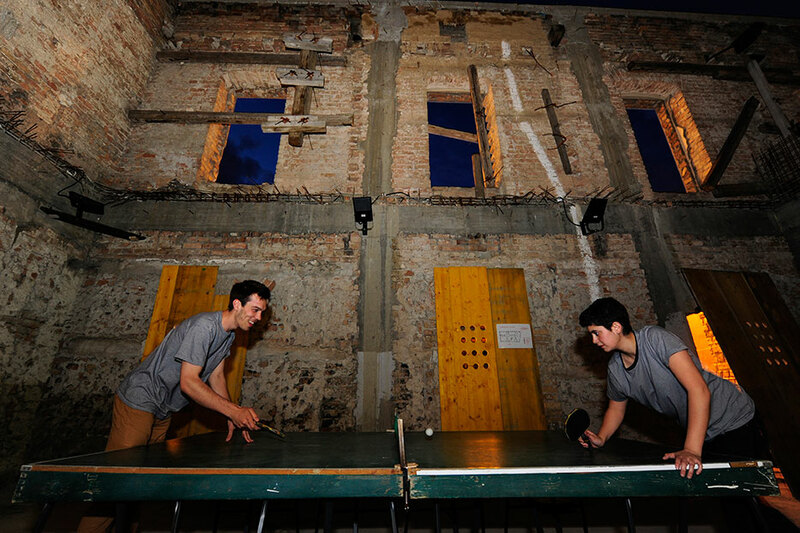 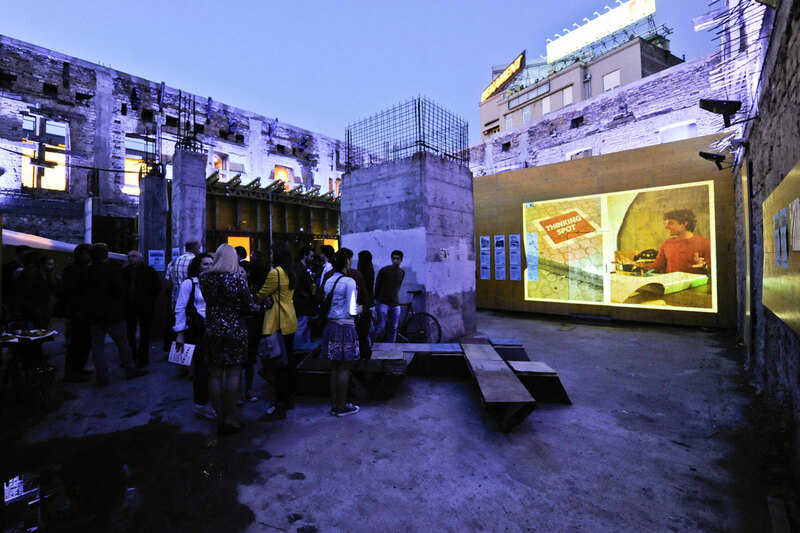 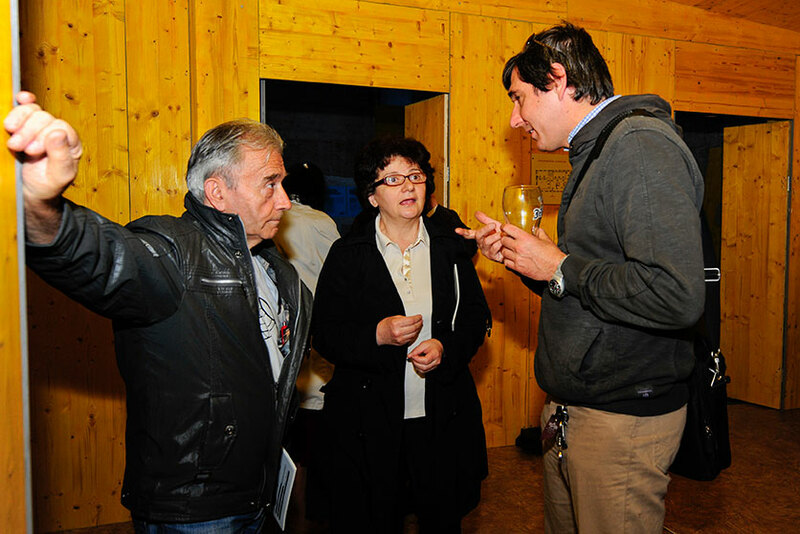 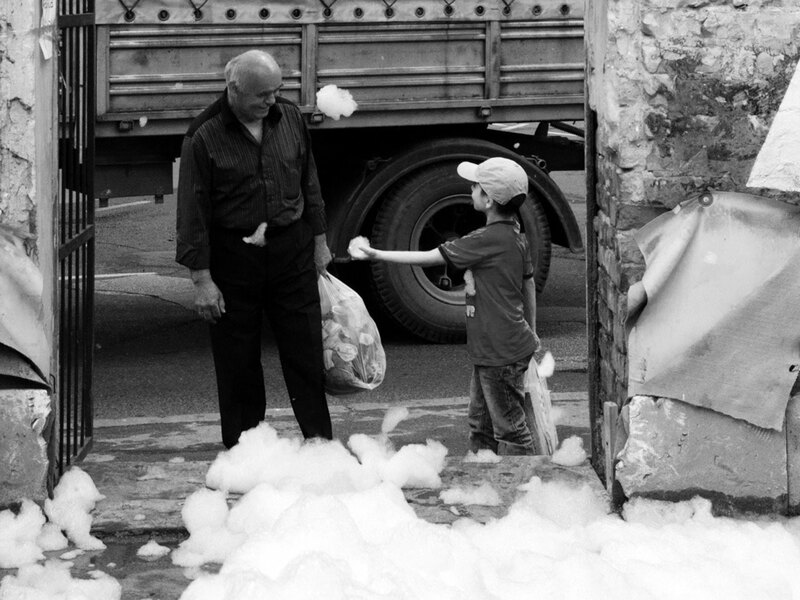 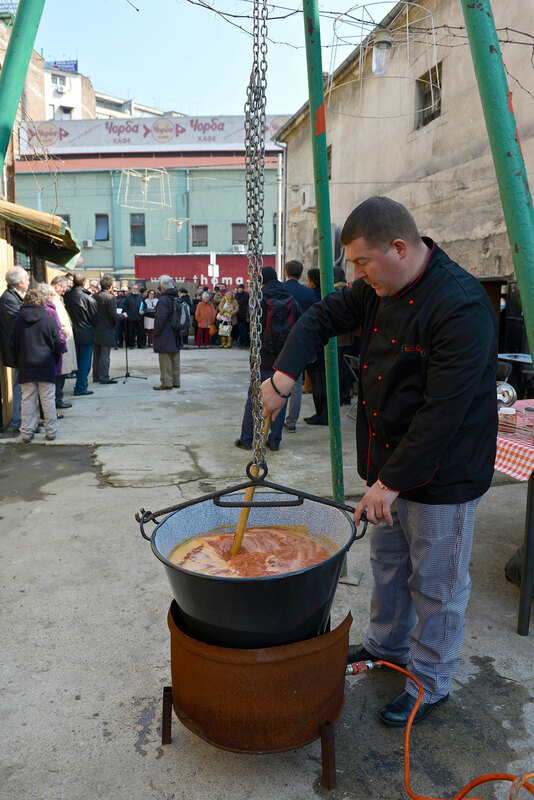 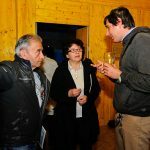 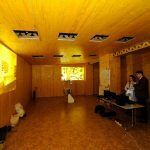 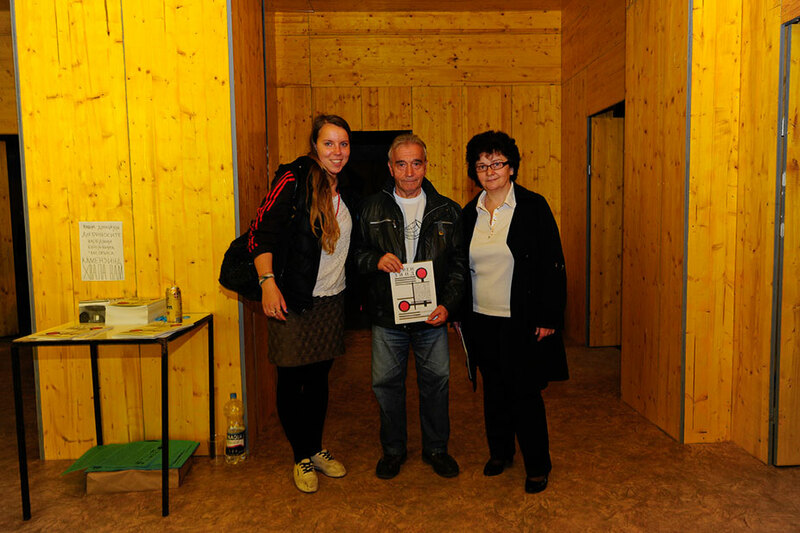 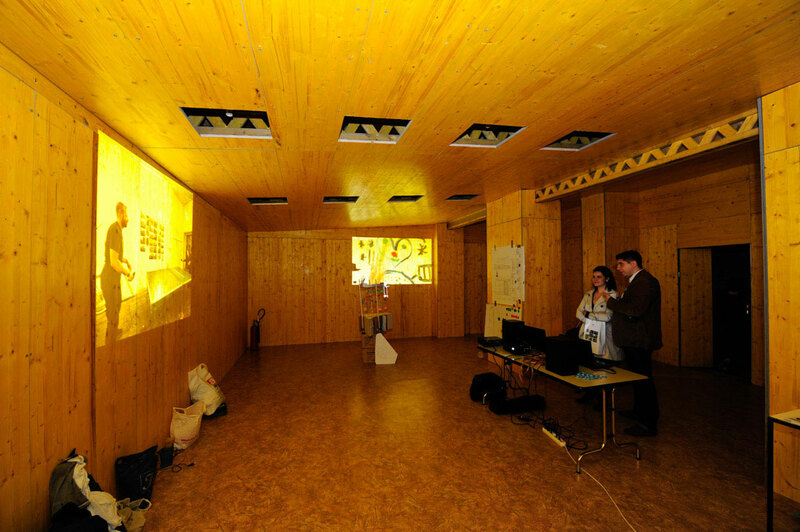 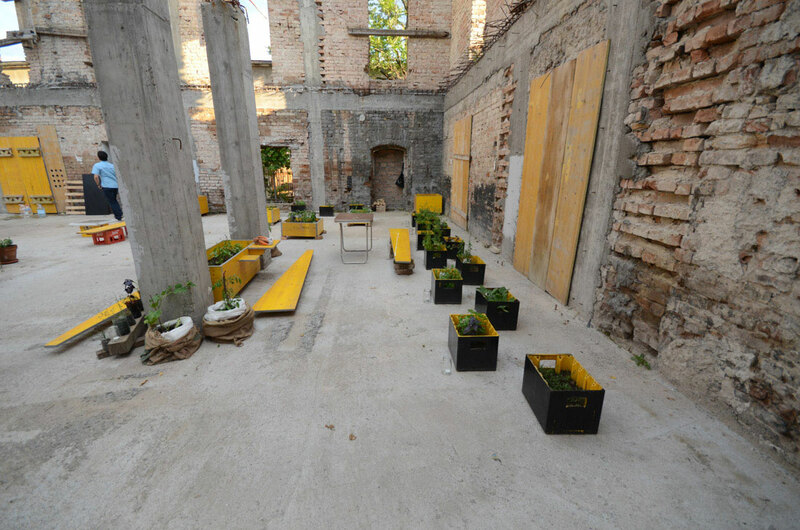 In 2012, temporary right of use of the premises was conferred to the Goethe-Institut Belgrad by the Municipality Savski Venac with intention to turn the “shell” into a community place. 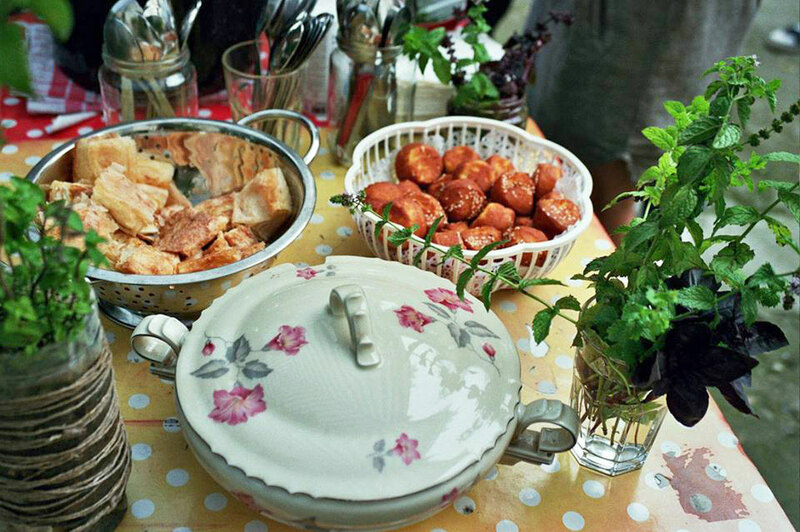 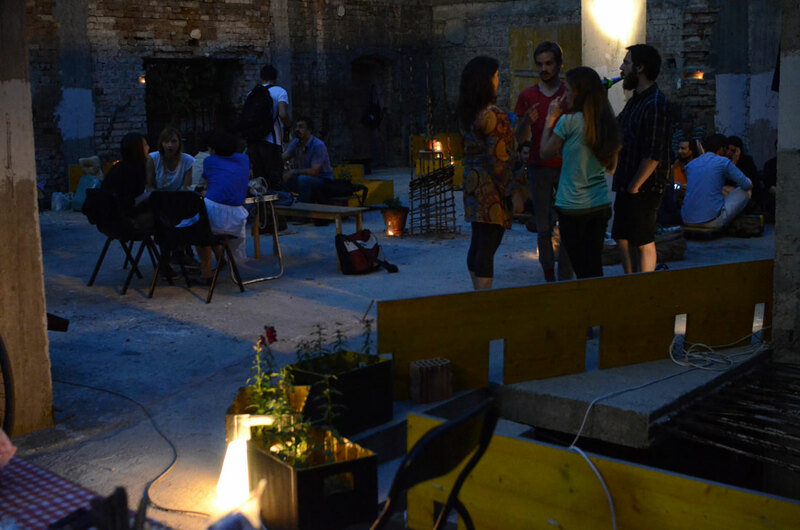 From 2013 to 2016 run by the Urban Incubator, the House was open to the public and transformed into a venue for various cultural and social events. 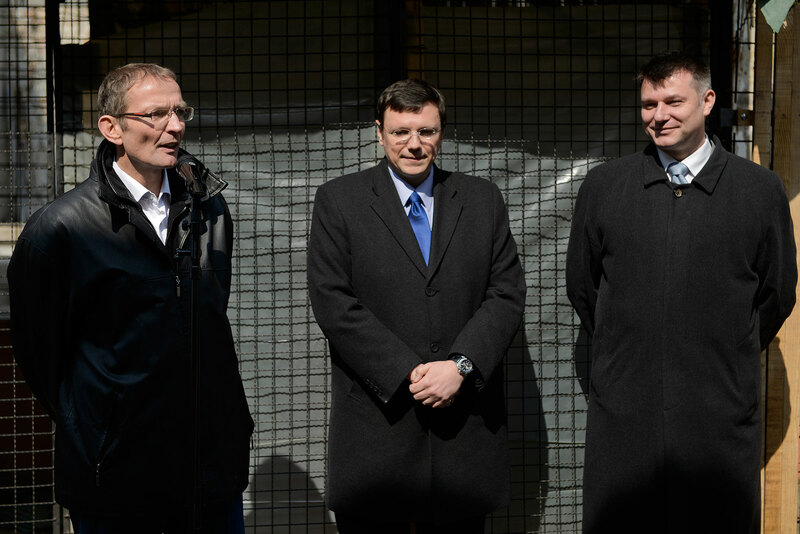 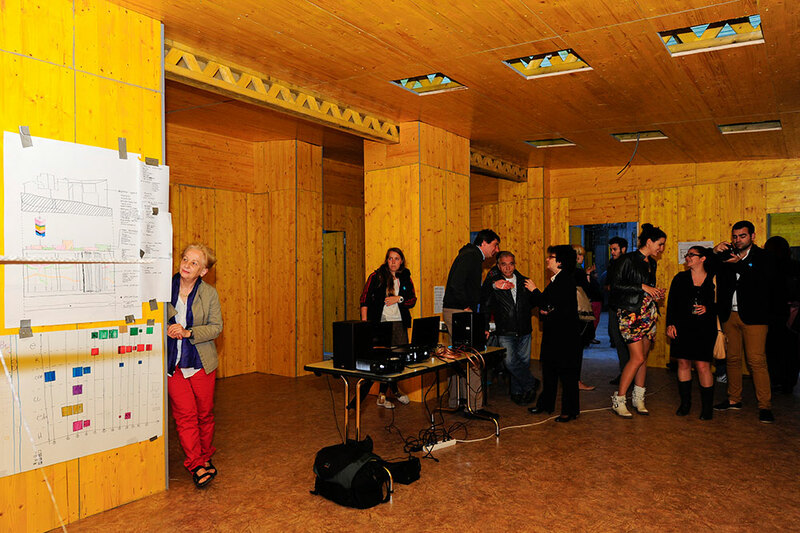 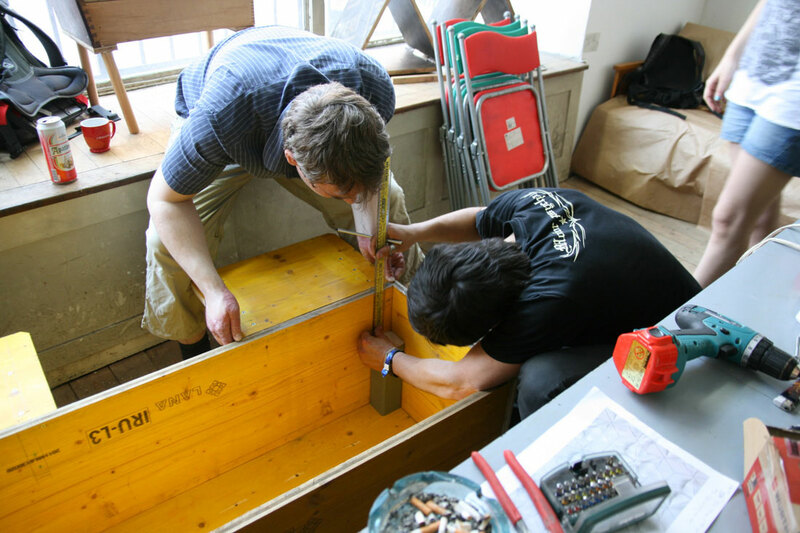 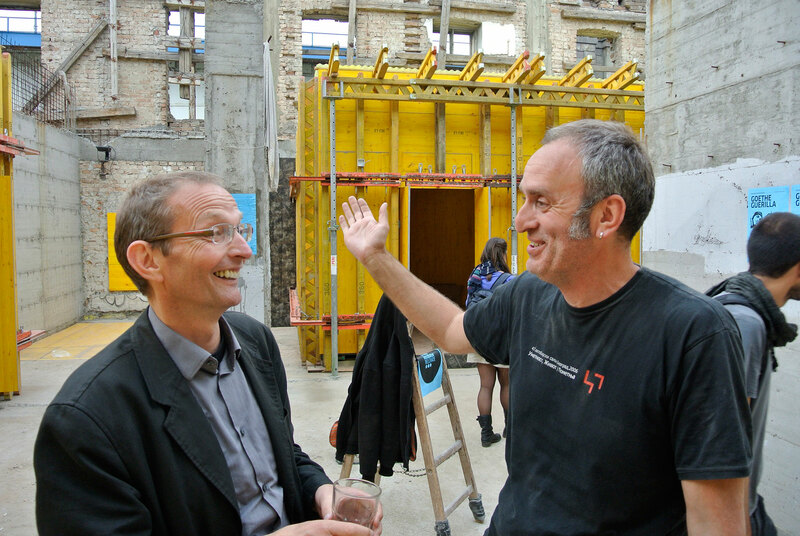 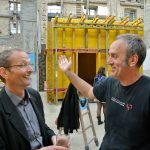 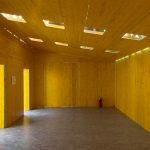 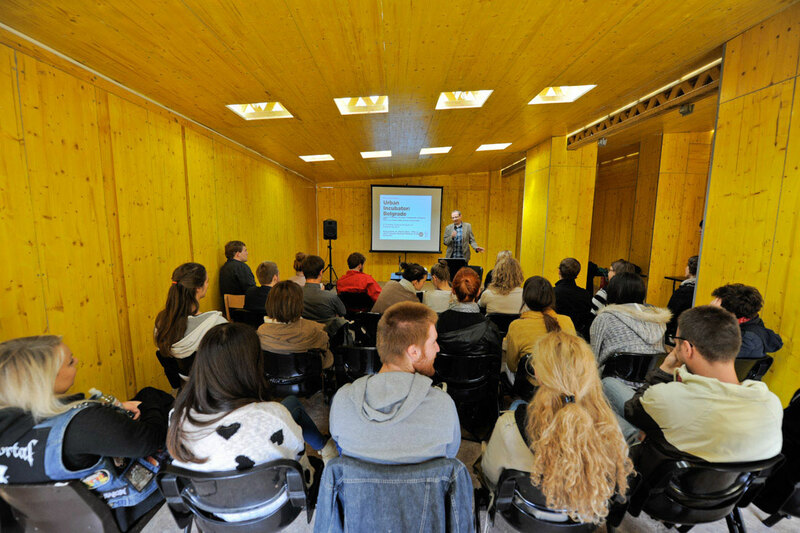 In 2013 a temporary pavilion was built by Tim Rieniets and Nikola Banković in the house as a “place of enablement”. 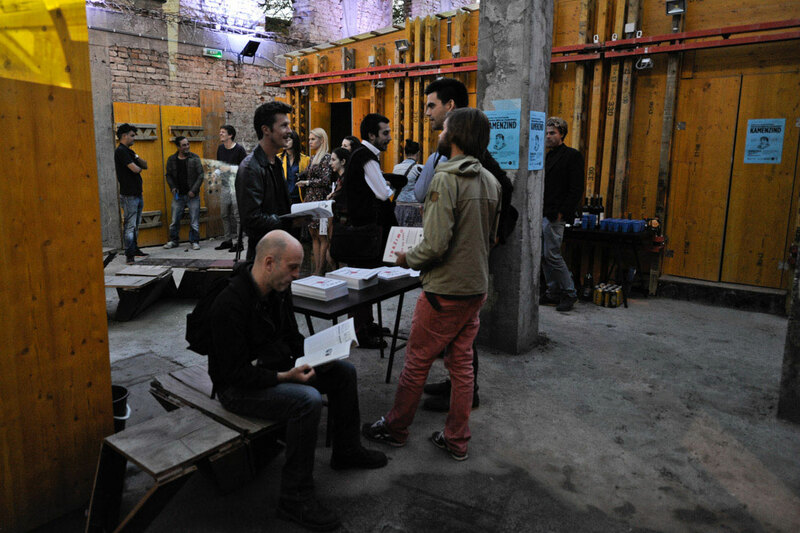 It hosted lectures, performances, concerts, debates, exhibitions and workshops. 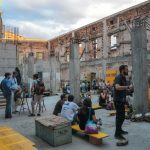 It became a place for multicultural and intergenerational exchange for both foreign and local artists, craftsman, activists, youth and neighbors. 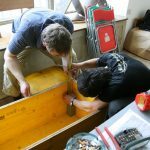 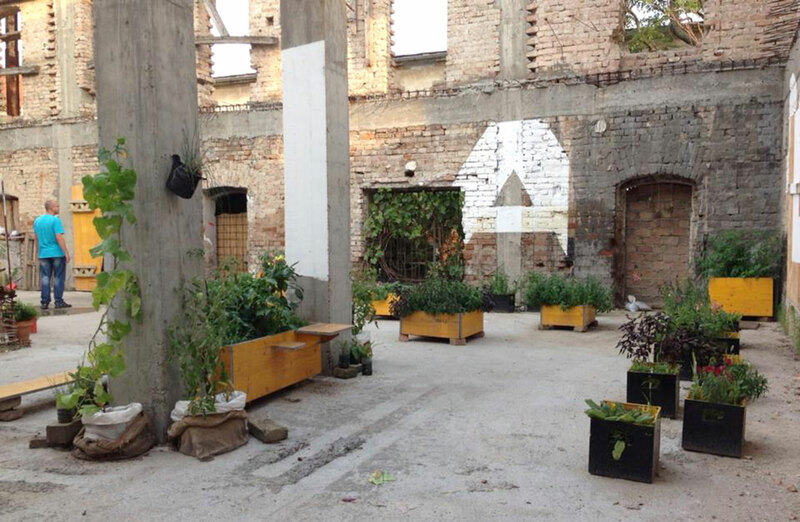 After the pavilion was disassembled in 2014, supported by the Urban Incubator the House was turned into an urban garden by self-organized community, neighbors and students. 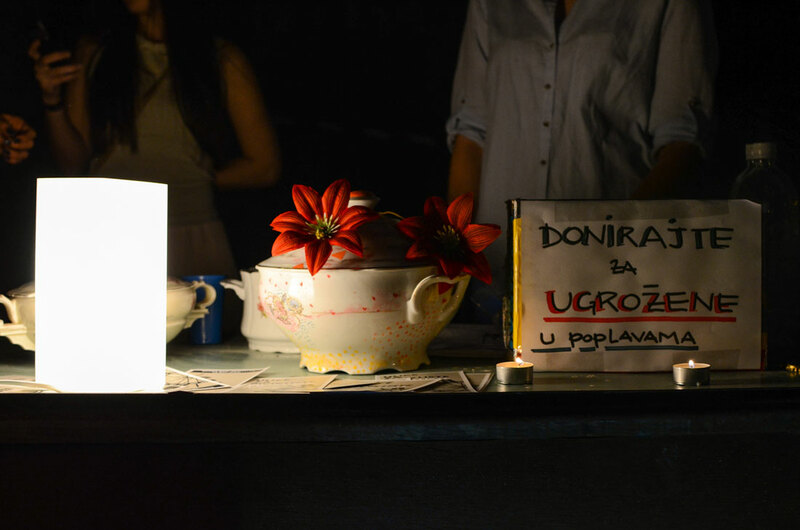 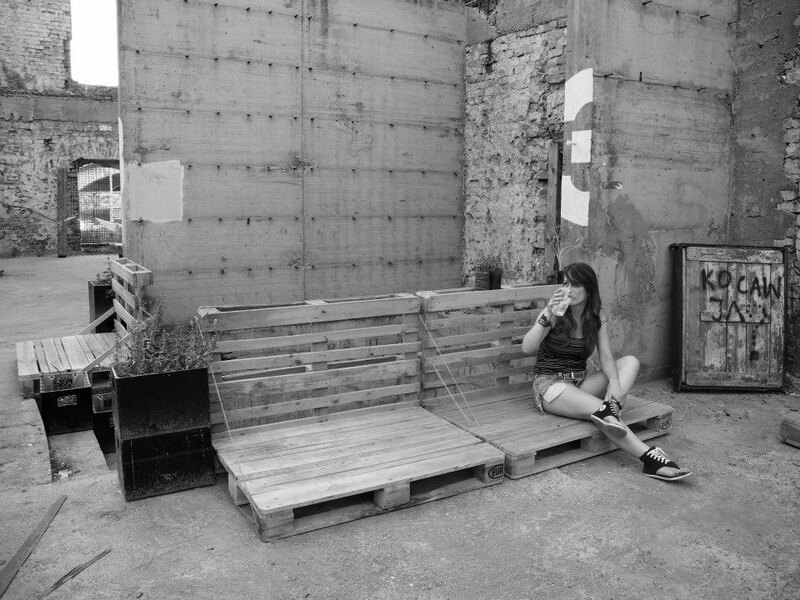 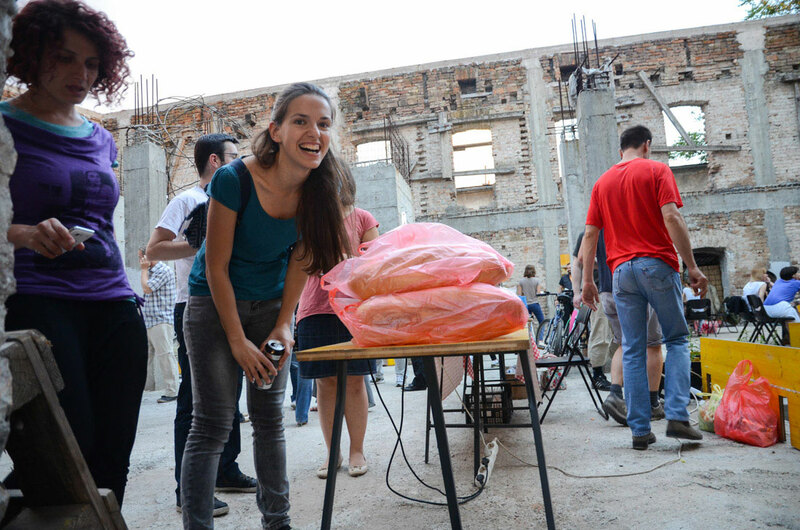 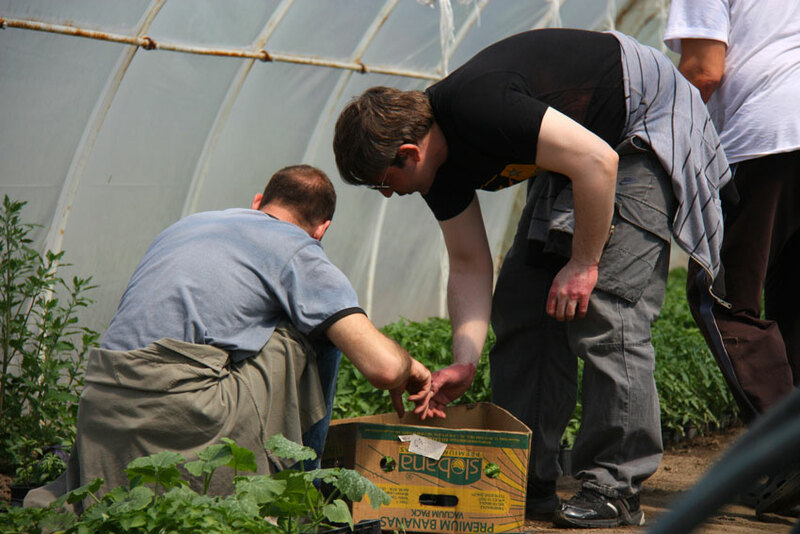 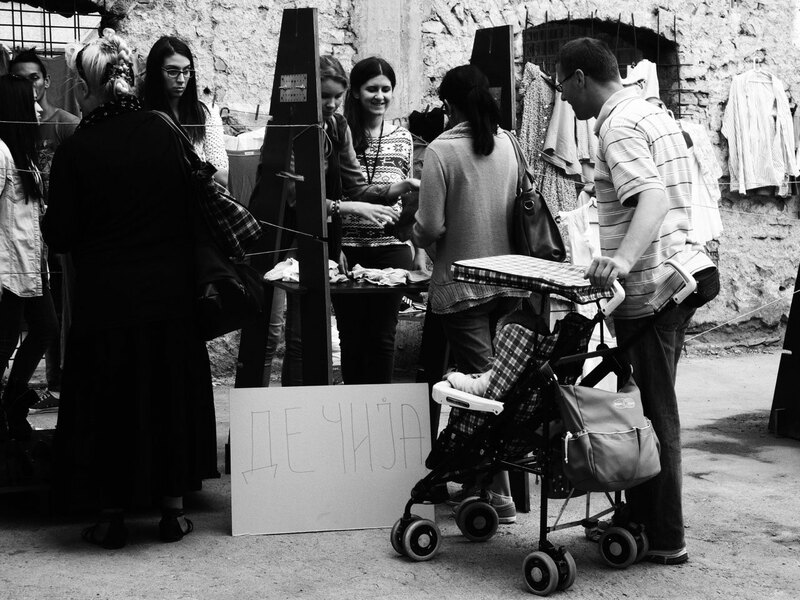 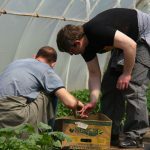 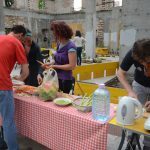 Through collaborative actions they have established Zdravamala the urban garden, designed and build multipurpose furniture and organized various social events. 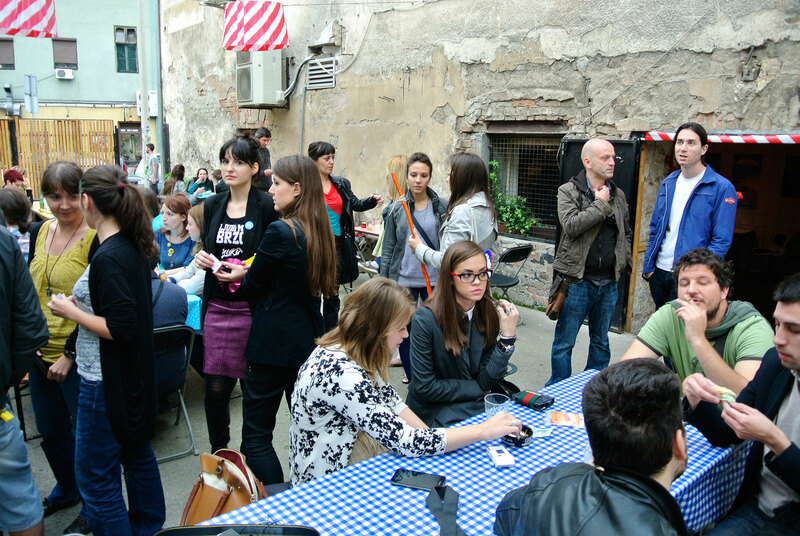 The House continued to serve as a community venue place. 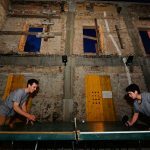 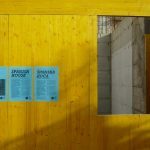 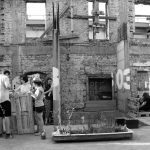 In 2015 the School of urban practices project run by the young architects from Belgrade and BÄÄÄM project of the Urbane Experimente e.V. 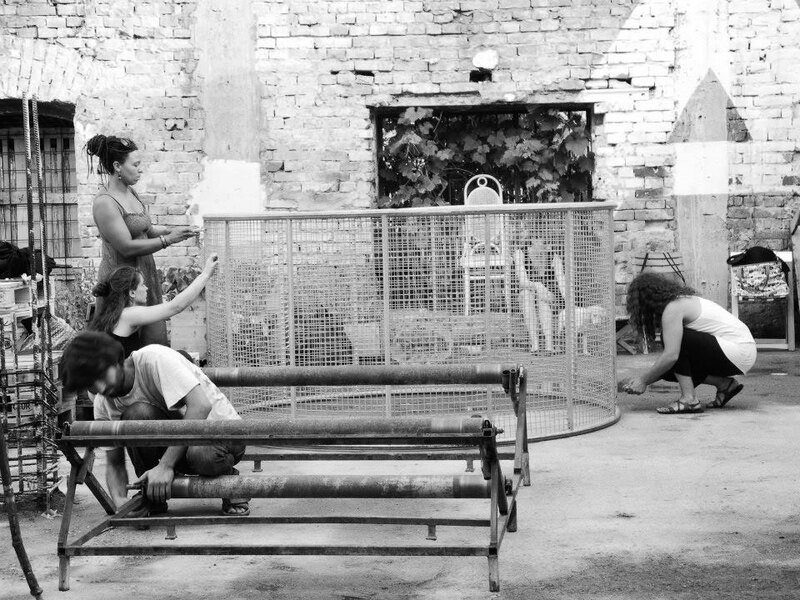 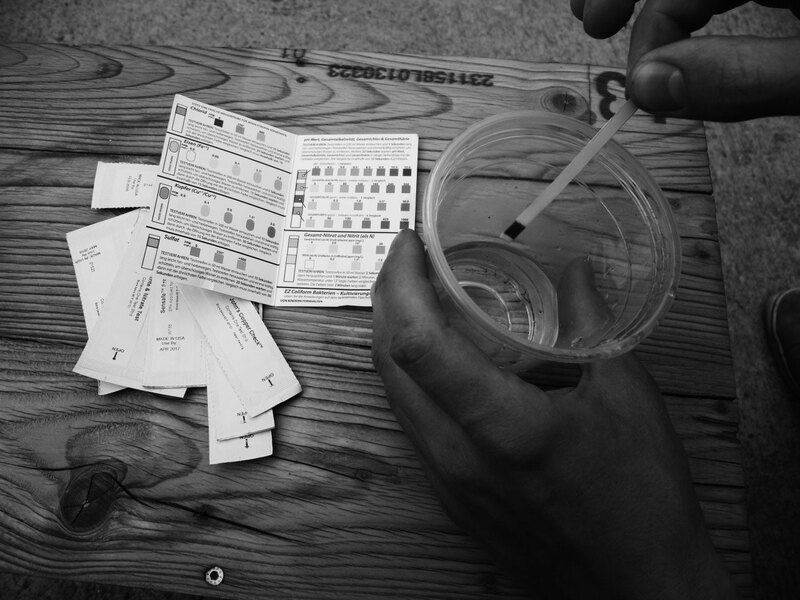 from Kassel took collaborative residency in the Spanish House. 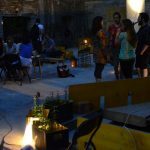 They used the House site as an open, participative space for action and made it accessible to outside parties. 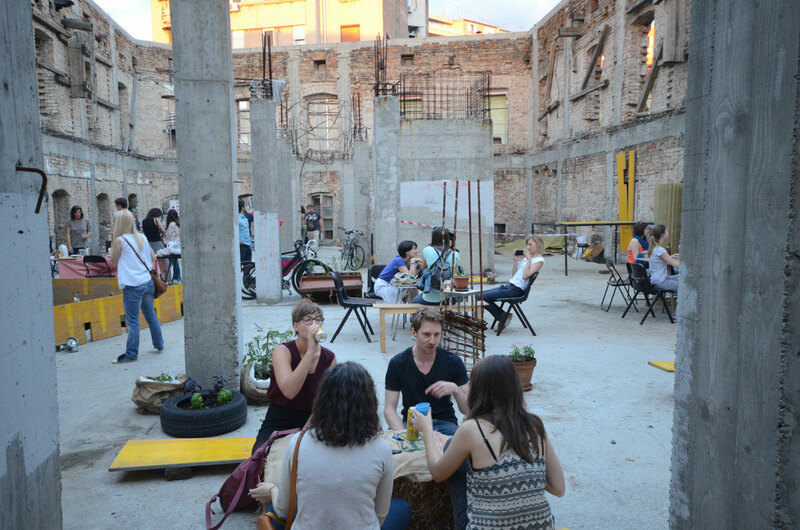 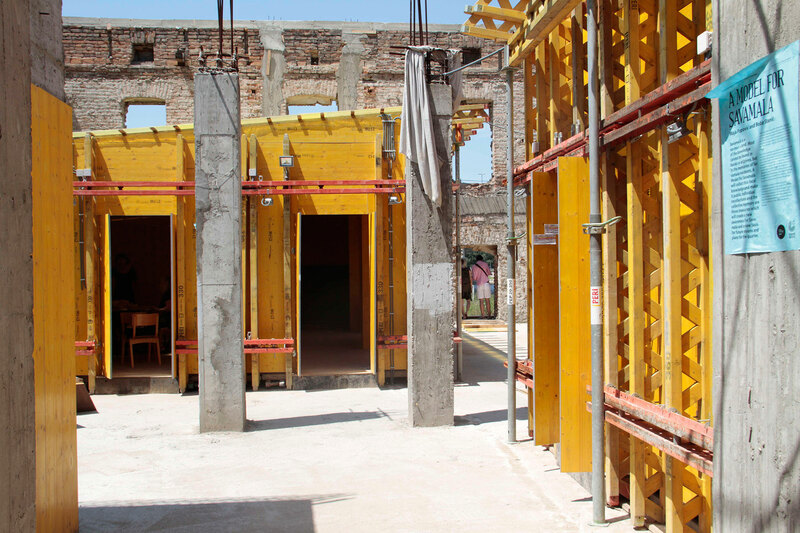 The Spanish House become a public space, with artists, planners and neighbors all able to make use of its qualities. 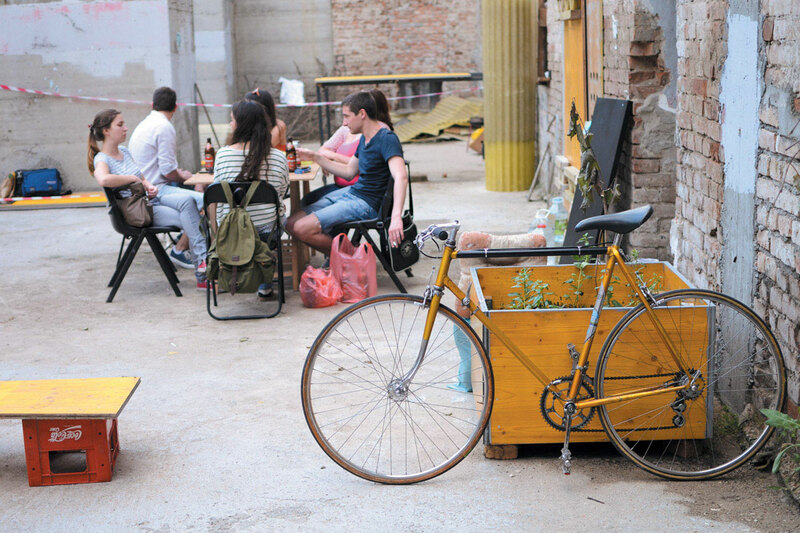 A place of both artistic production and experimentation, and place of social interaction. 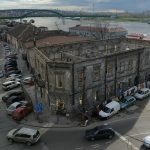 In the late 2015 due to the local politics and big investment project Belgrade Waterfront, the building of a Hotel on the site of the Spanish House became hot topic again. 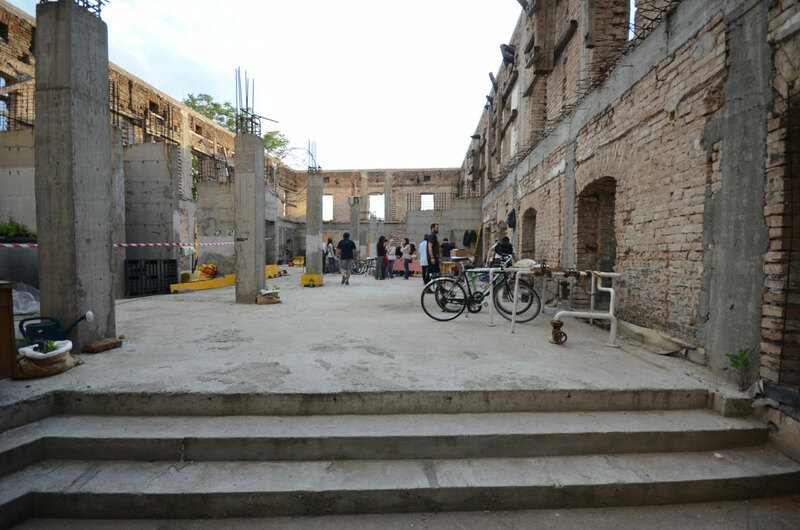 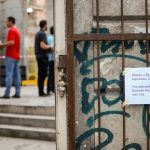 The Goethe-Institut Belgrad have lost the premises to use the building. 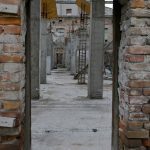 Since the beginning of the 2016 the building is abandoned and empty again. 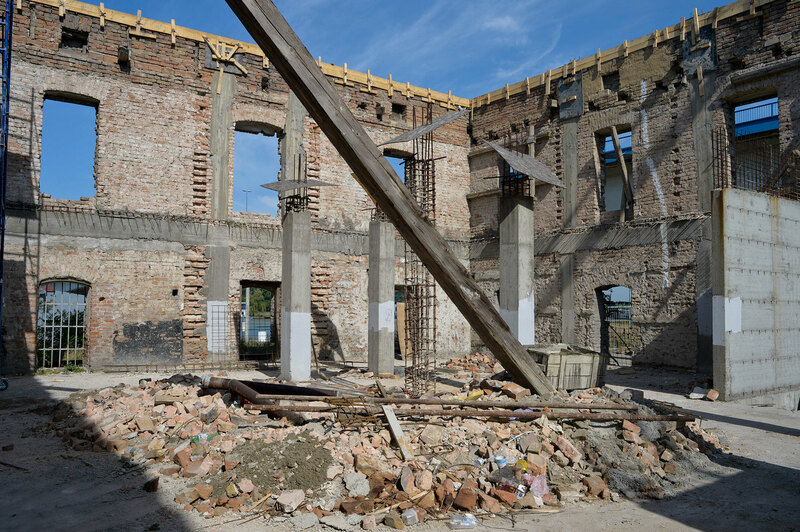 There is no evident information about the Hotel nor signs of a construction progress. 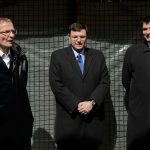 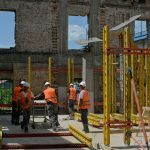 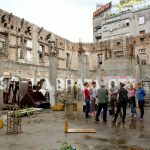 With its large-scale project Beograd na vodi (Belgrade Waterfront), the city government intends to turn Savamala’s 180 hectares (0.7 square miles) into an upscale area to fit the tastes of the project’s Middle Eastern backers. 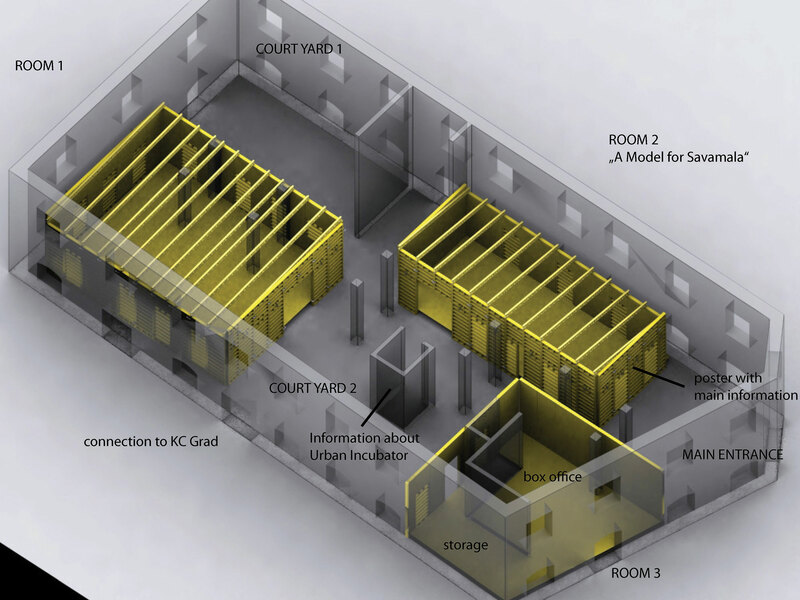 The current model shows a cultural center on the site of the Spanish House. 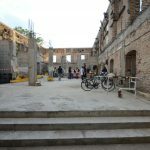 You will enter the Spanish House at its former main entrance and walk up a rough but beautiful flight of concrete stairs. 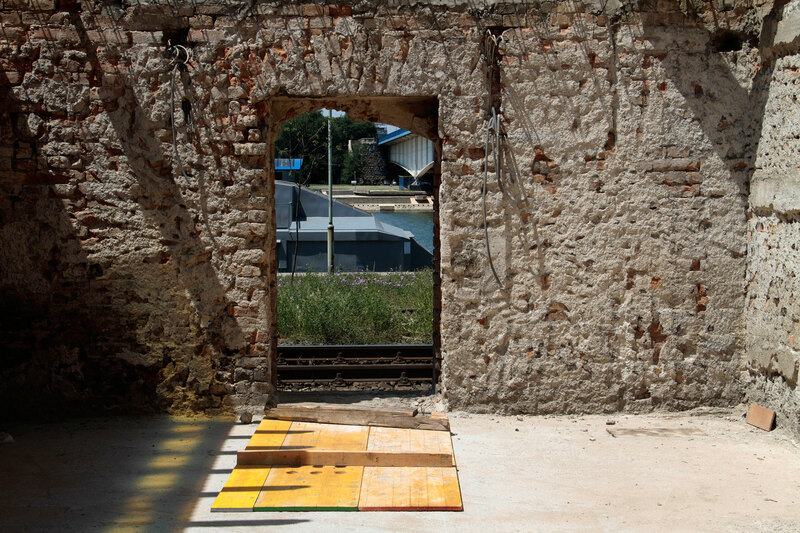 The purpose of these stairs was most probably to lead to a new hotel reception. 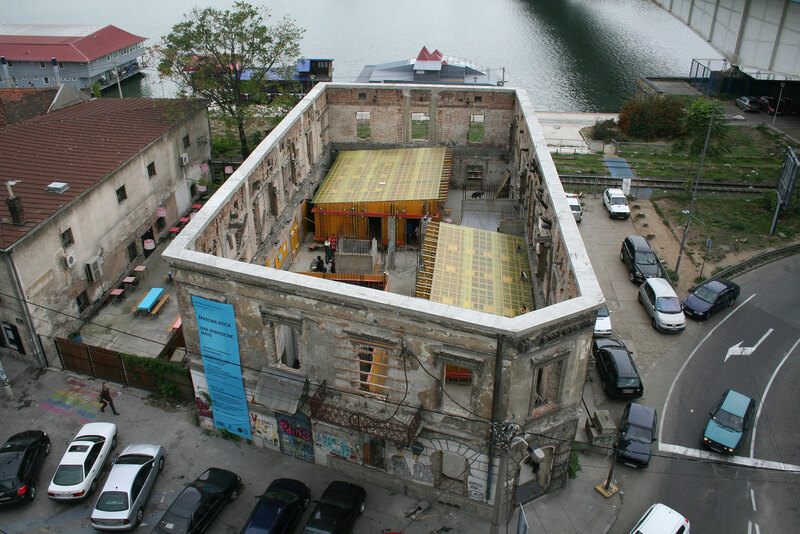 In the 1990s, the Spanish House was given to an investor who wanted to convert the historic building into a modern hotel. 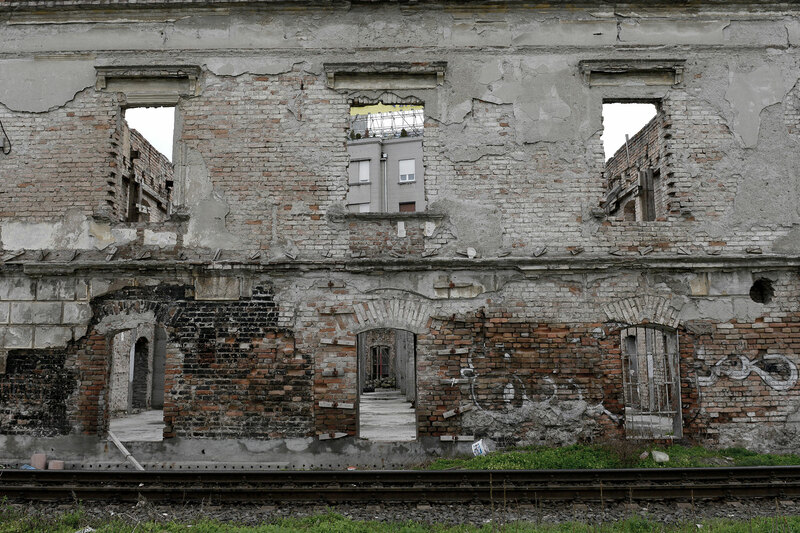 He took out all interior walls, ceilings, and the roof and started to rebuild it from the inside. 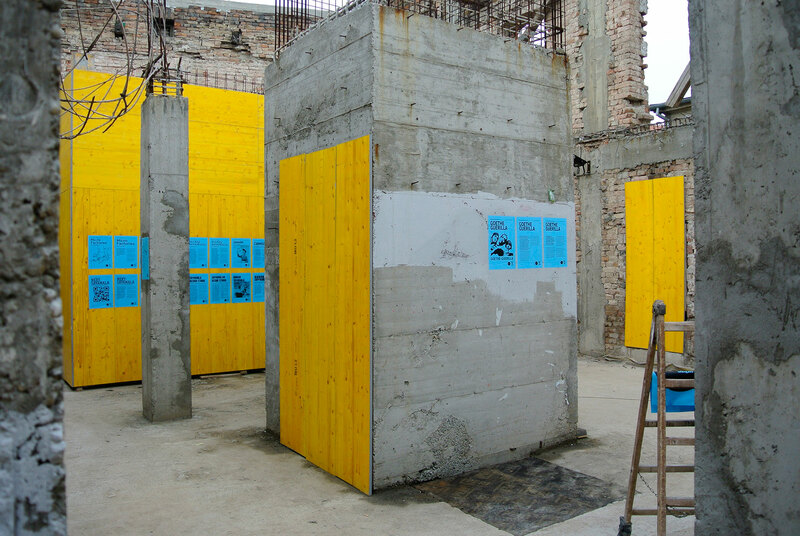 But due to financial problems he couldn’t accomplish his plans and left the Spanish House with a second layer of dilapidation: A new but unfinished concrete basement, some columns and an open elevator shaft – the remains of an unfulfilled future, which are now in strong contrast with the natural stones of the historic facades. 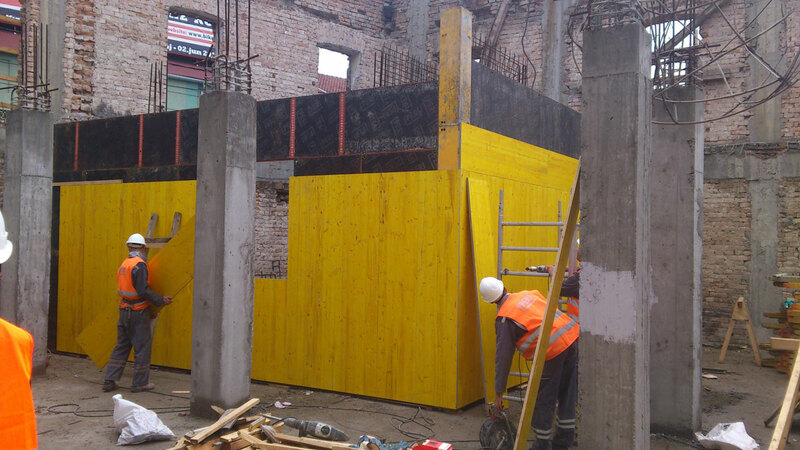 This decision to use formwork was made for many reasons. 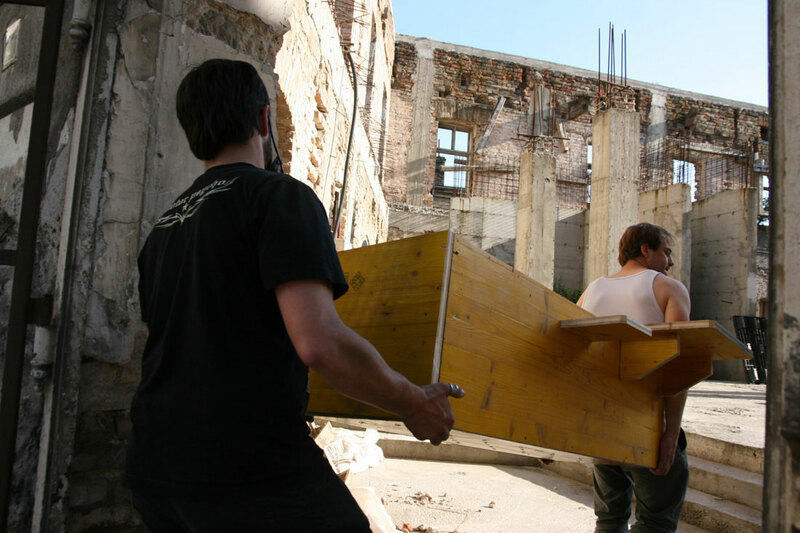 Firstly, in order to be able to build the event space in a short period of time and with a very small budget only. 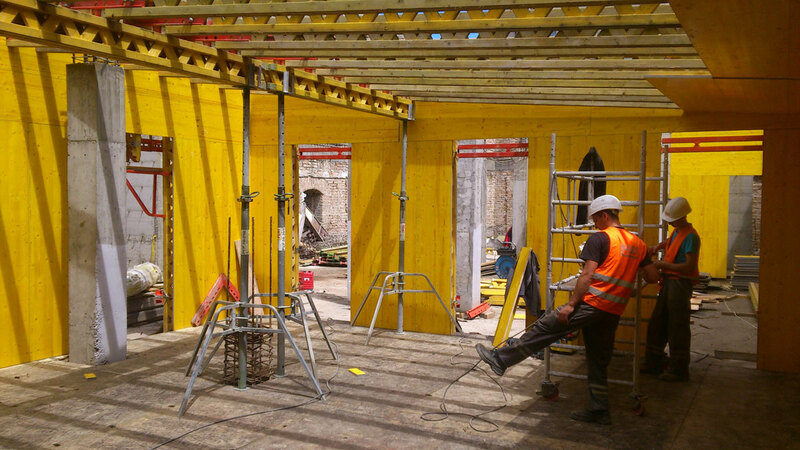 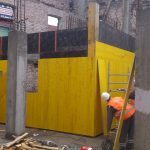 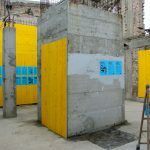 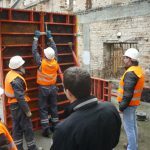 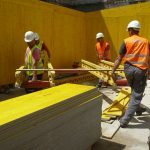 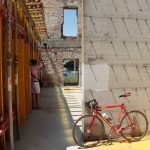 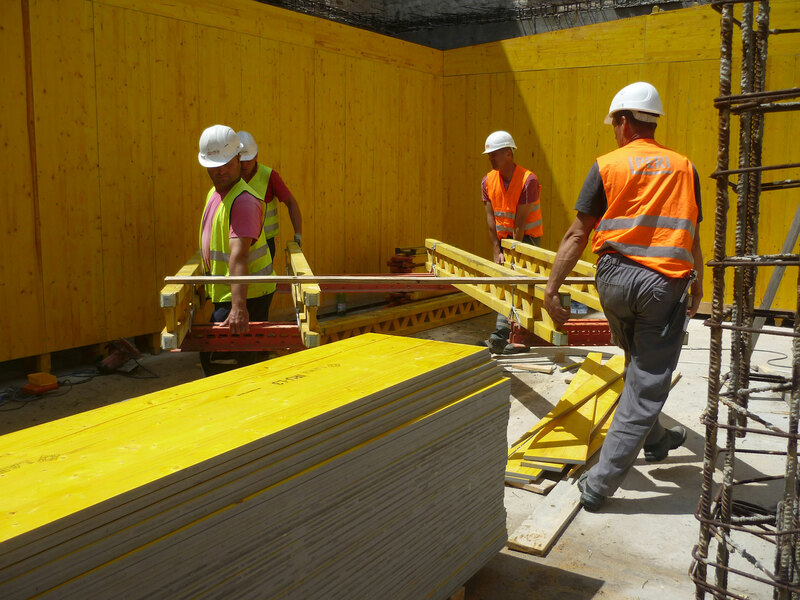 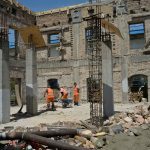 The formwork technology can be put up and removed, at the project´s defined end of tenure, without leaving traces and without having even touched the interior structure of the heritage protected façade which was left as an empty shell by the former investors. 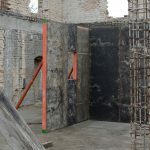 Secondly, the decision was taken for aesthetic reasons: The concrete formwork pays tribute to the general impression of the rough and the unfinished. 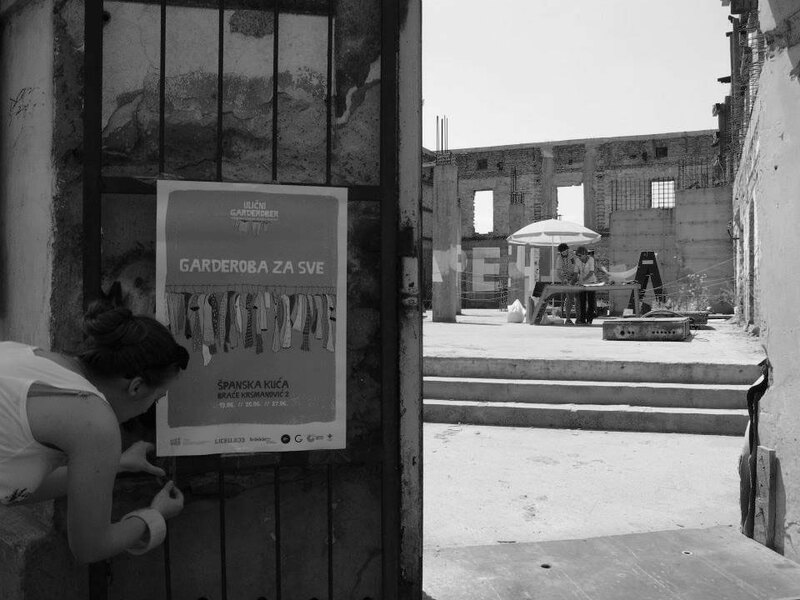 The first open space is the entrance area; the second one is the central space, or square, of the pavilion, connecting all elements of the event space with each other; the third open space is a rathersmall and intimate one, allowing a glimpse at the river Sava. 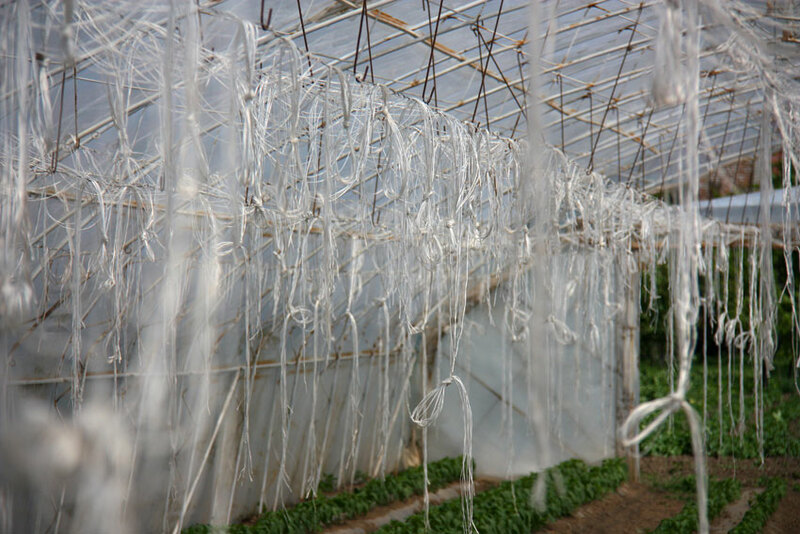 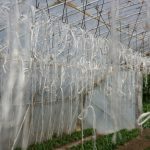 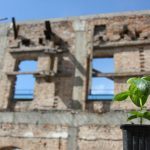 Welcome to the green and healthy little Savamala – that is what the Serbian composite of “zdrava” and “Savamala” implies as the first urban garden project started in May 2014 with the transportation of more than 500 plants from the plains of Vojvodina (Opovo), to the Spanish House. 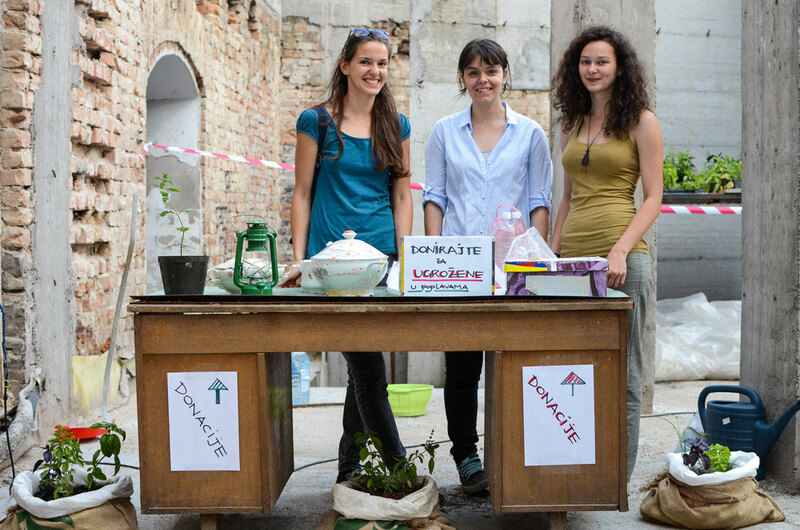 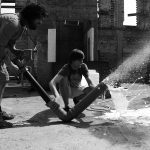 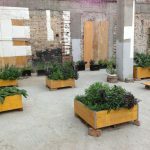 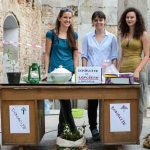 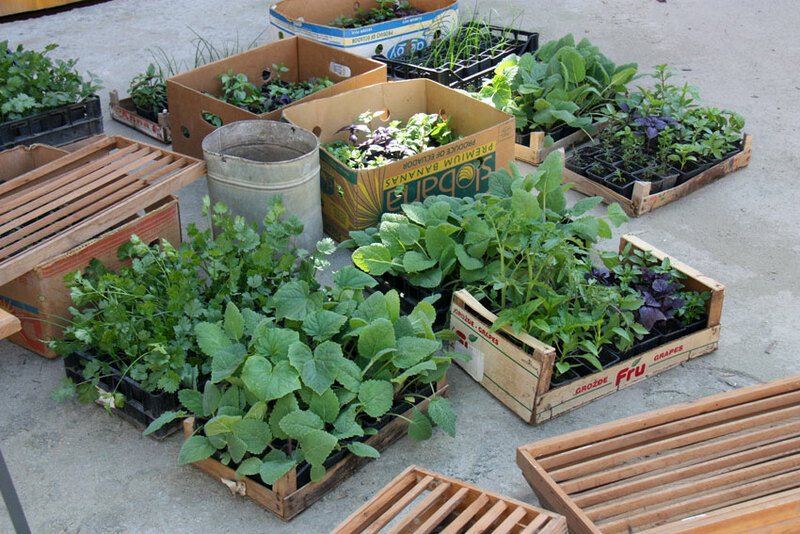 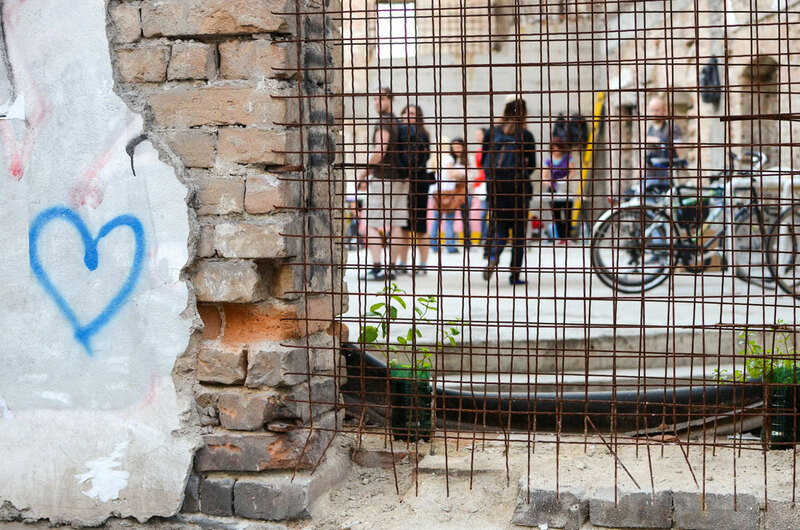 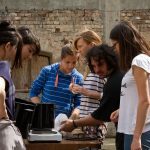 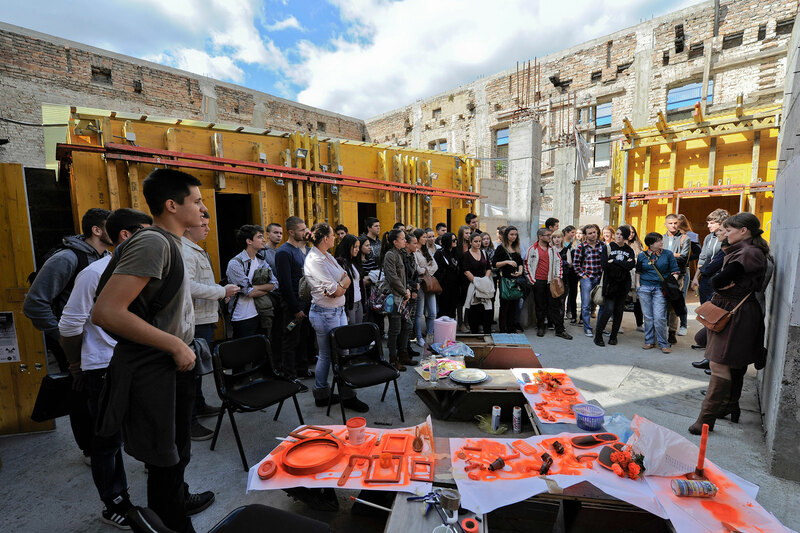 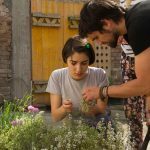 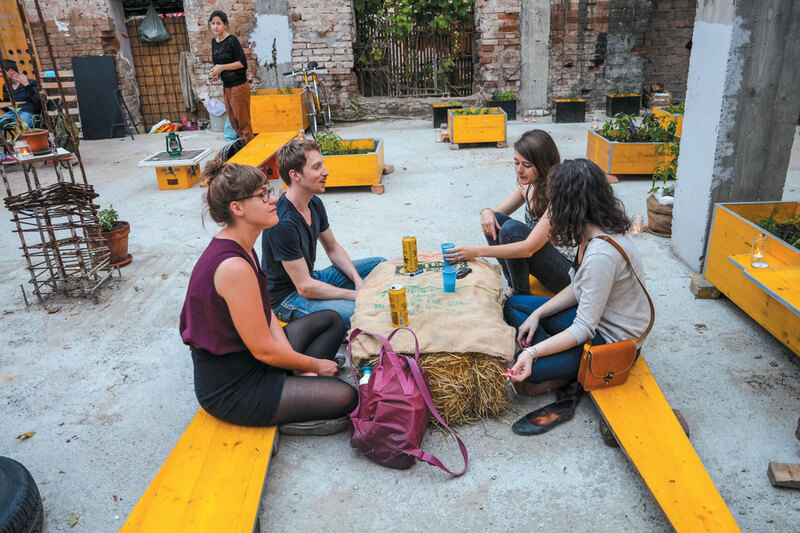 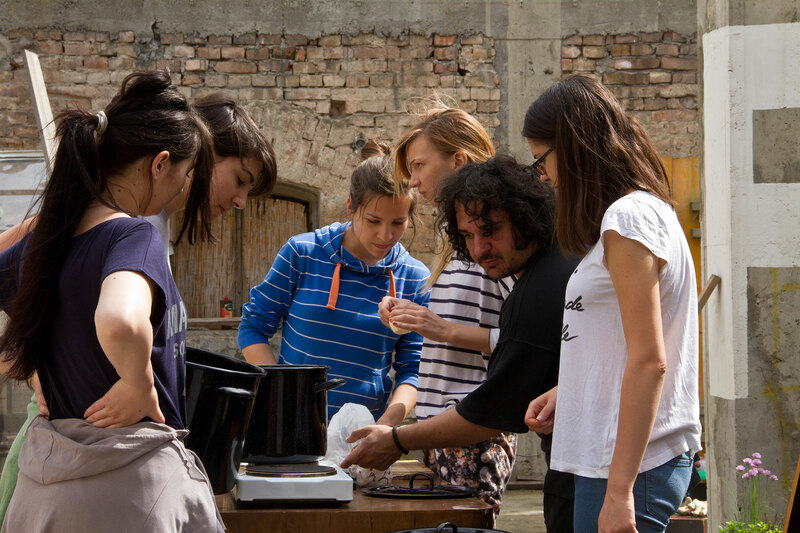 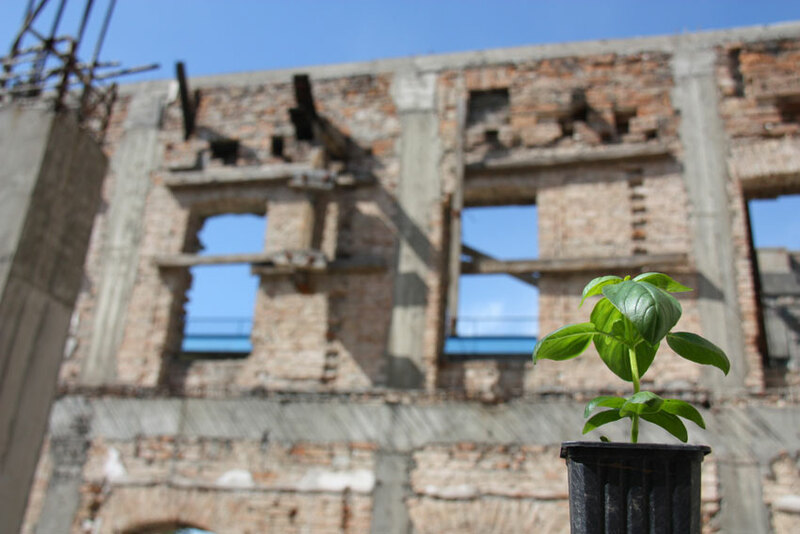 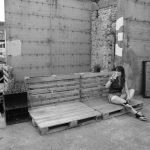 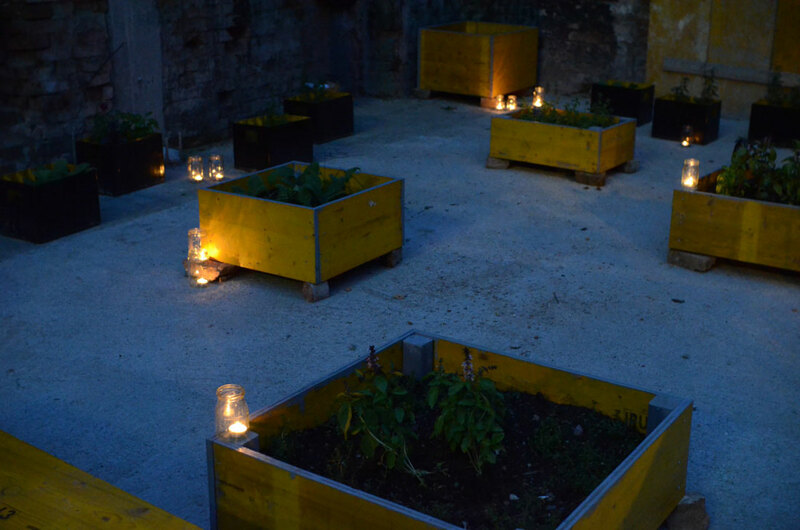 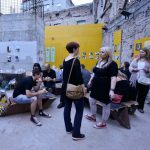 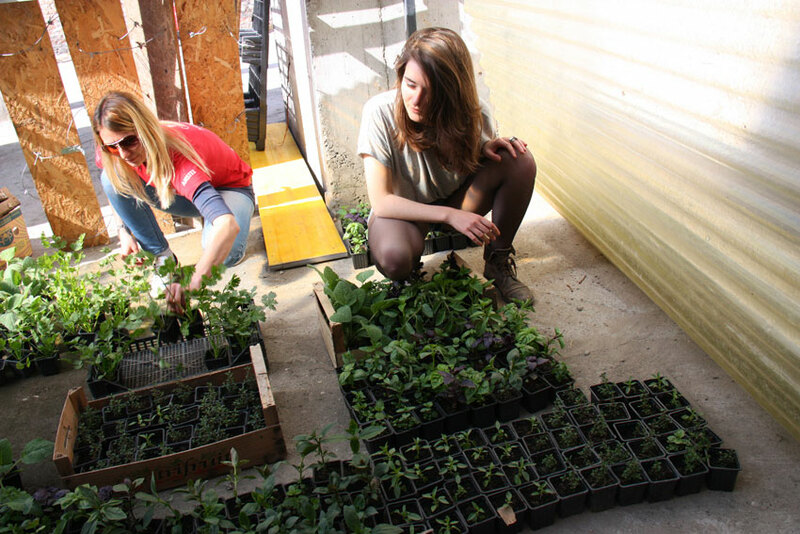 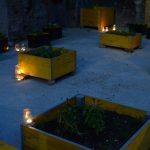 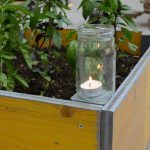 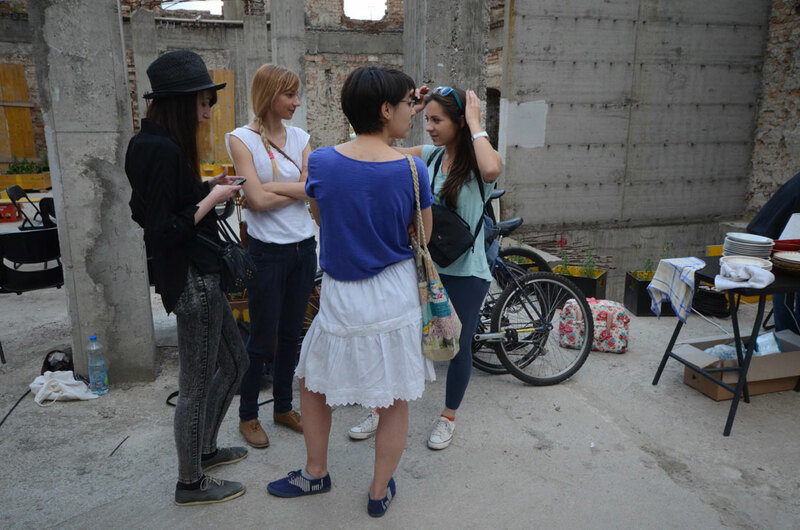 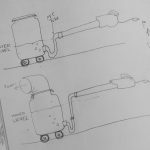 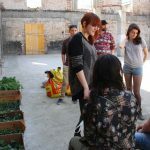 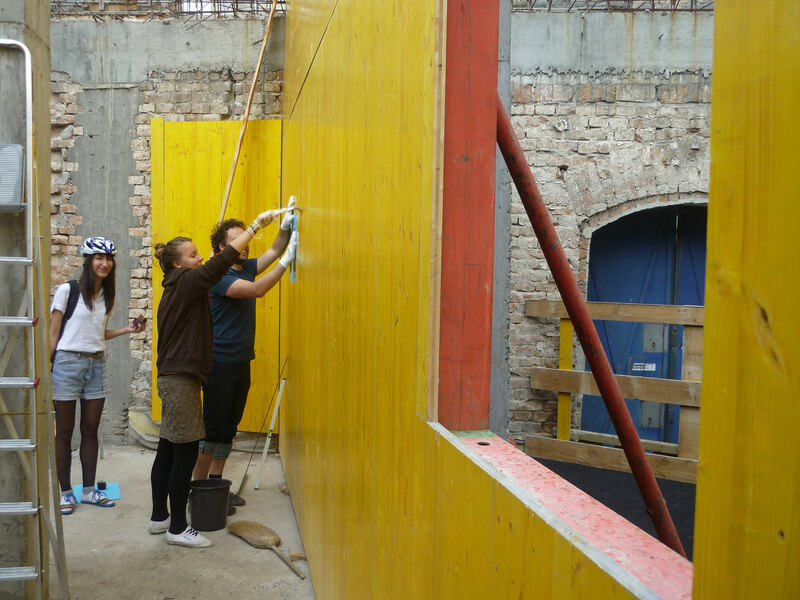 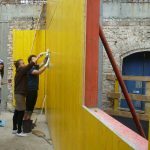 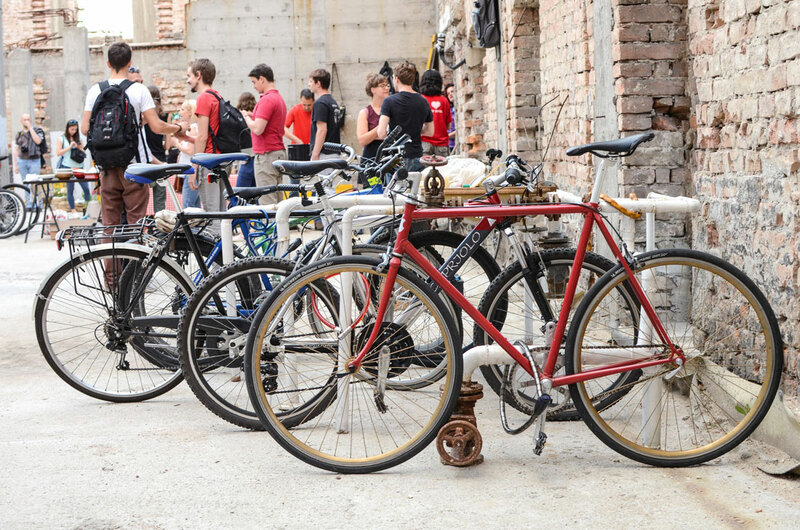 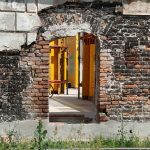 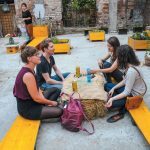 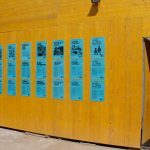 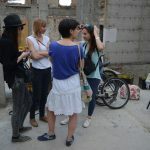 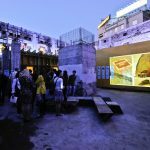 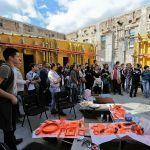 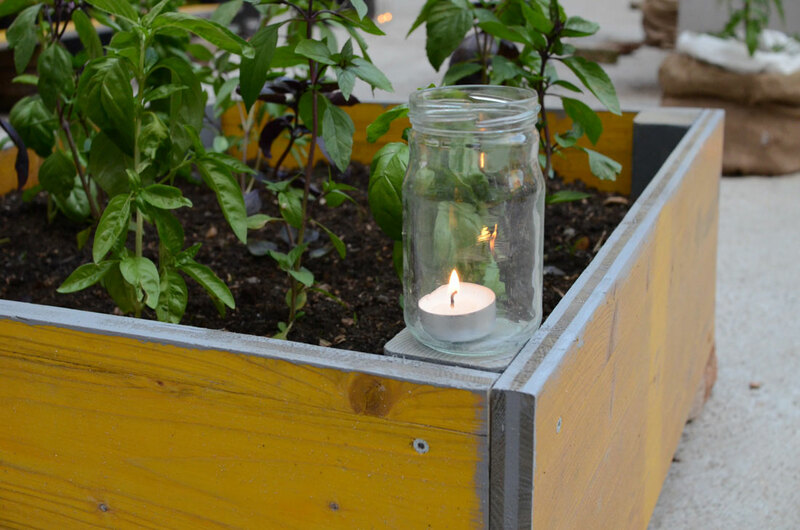 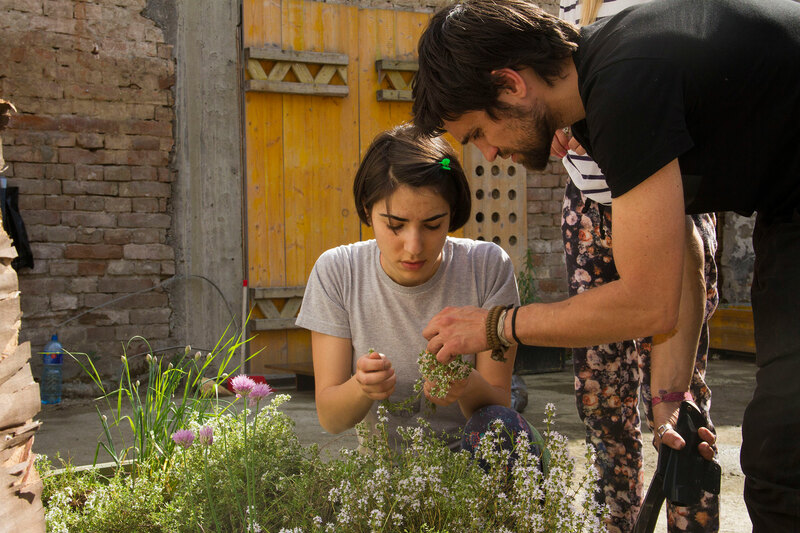 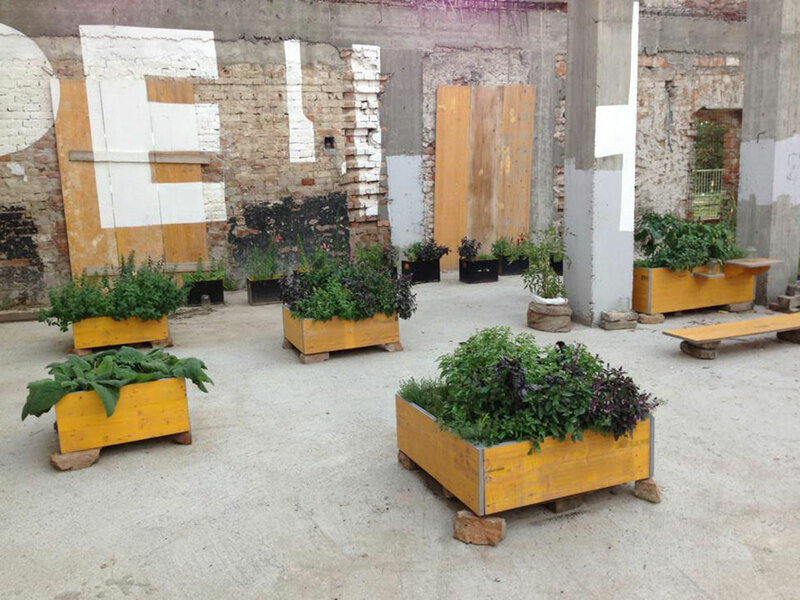 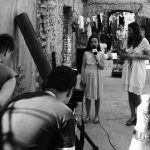 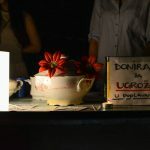 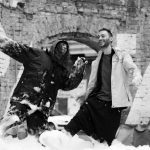 The project has brought together young designers, gardeners, and Savamala residents with the idea to promote urban gardening and experiment with eco-design, creating various objects built of either found and recycled materials. 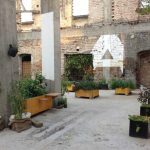 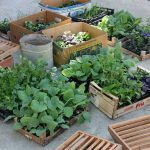 By creating a new physical space (garden) in the Spanish House and facilitating knowledge exchange through established social networks, Zdravamla has created a new urban community, which grows food and beautifies the neighborhood. 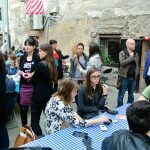 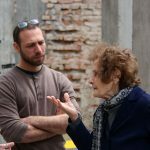 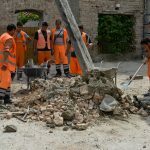 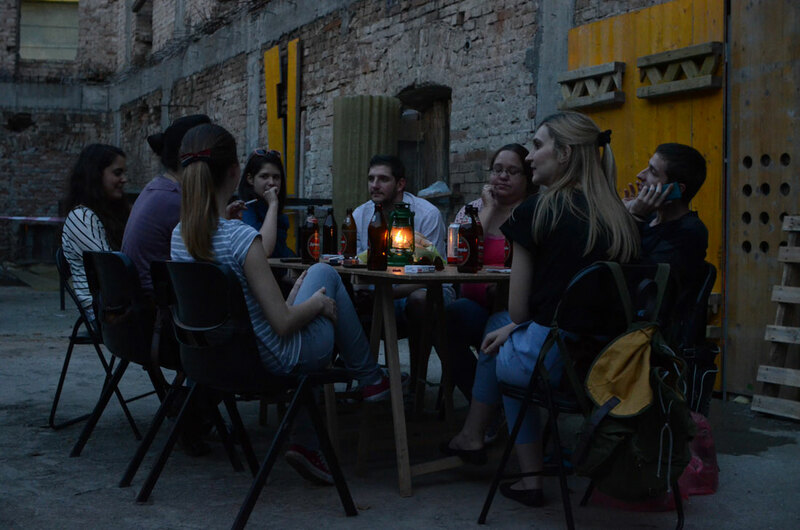 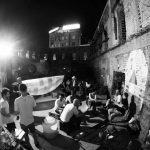 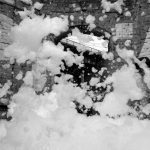 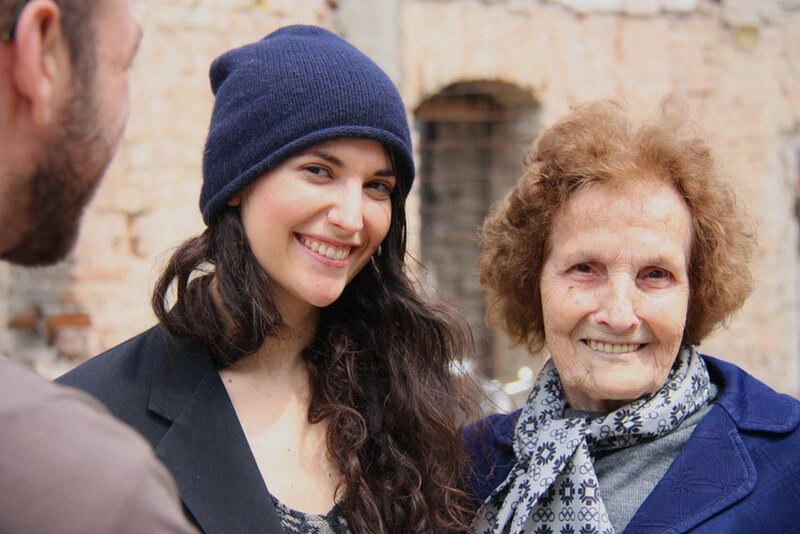 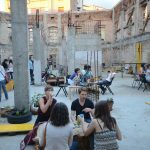 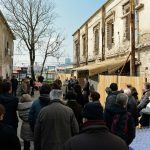 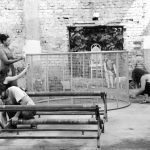 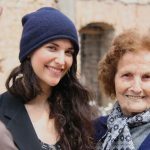 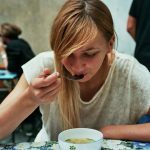 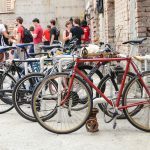 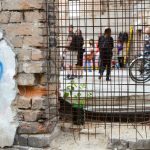 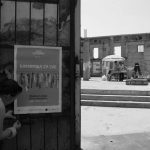 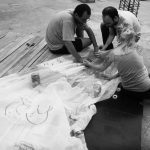 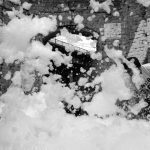 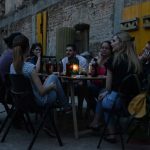 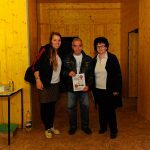 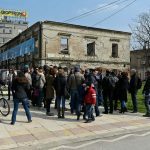 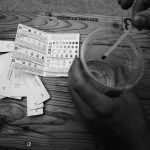 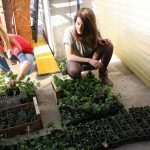 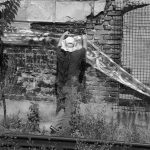 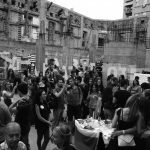 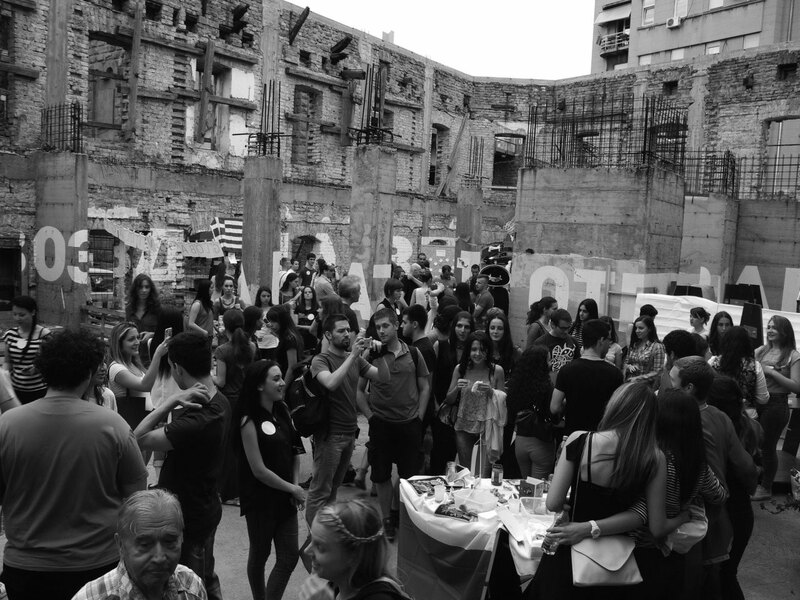 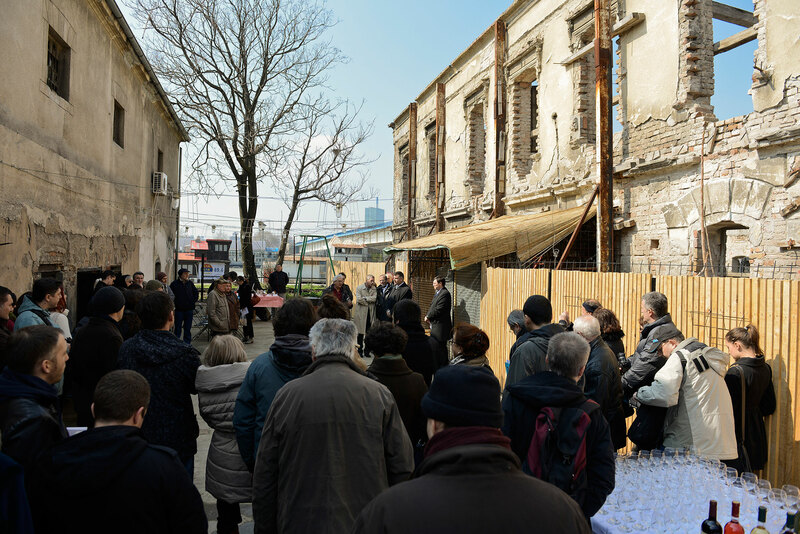 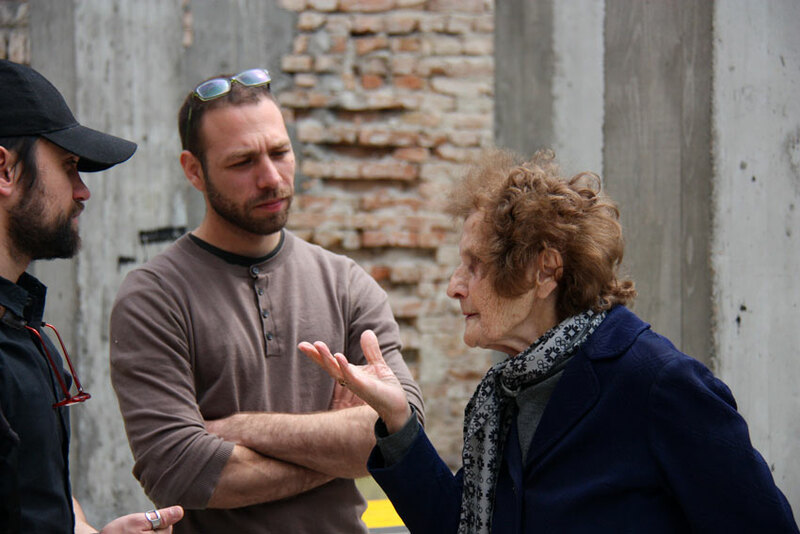 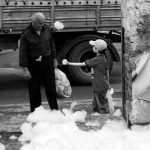 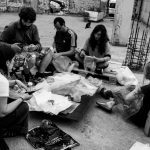 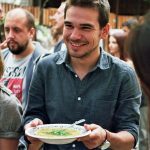 By doing this, it has enrich the quality of life in the area, created a place for social interaction and inspire others to take independent actions for further urban ecology initiatives in the Savamala. 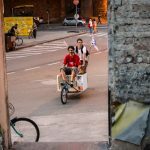 BÄÄÄM – out of the house and into the city! 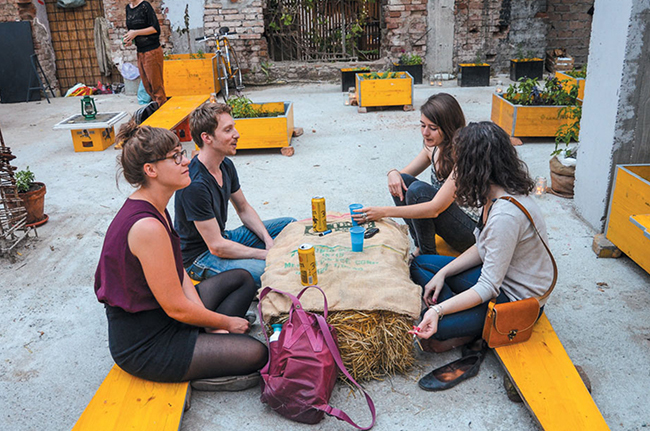 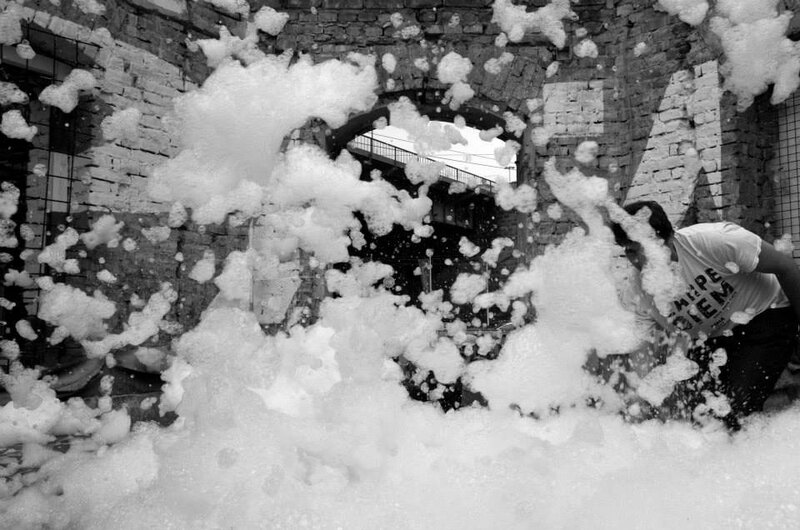 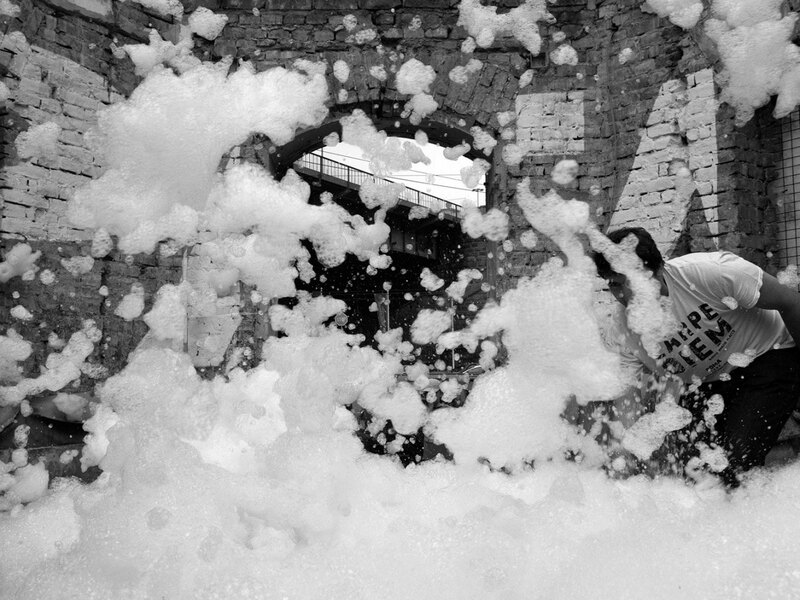 The name “BÄÄÄM: Urban Experiments on the Sava” both states a theme and presents a challenge. 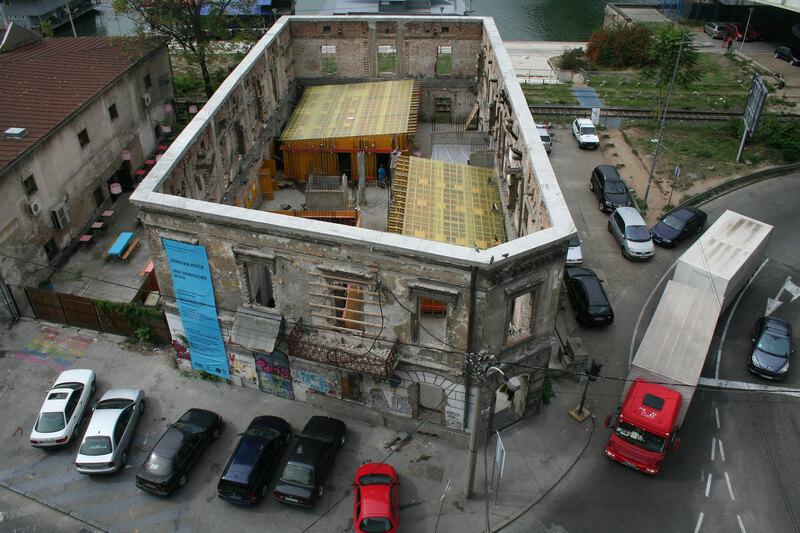 BÄÄÄM address the building and its particular characteristics, extending an invitation to investigate its structural features in specific and productive ways. 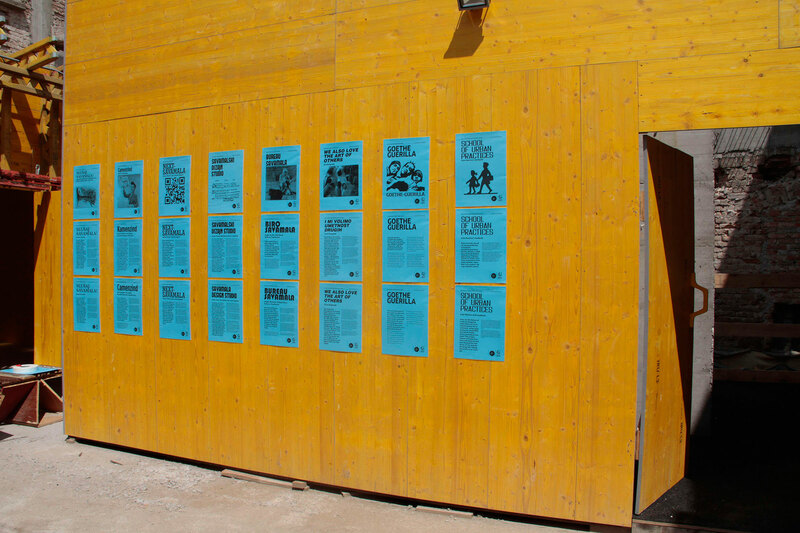 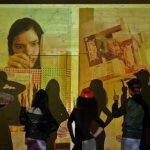 Designed for participation, the project took place in summer 2015 with the cooperation of various individuals, collectives and institutions. 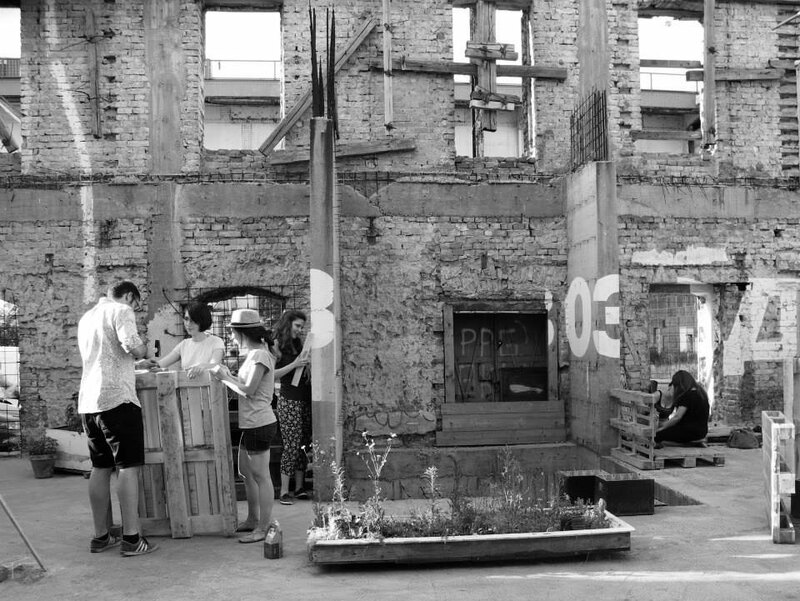 BÄÄÄM provides an opportunity to discuss current strategies for urban development with different communities, taking a closer look at the spatial and social qualities of the city and asking questions that could have quite an explosive effect, even when asked quietly. 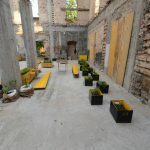 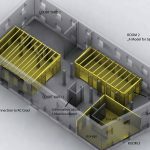 We activate the building as we experimentally probe the unique qualities of the space; through our actions, we changed the way the site is perceived. 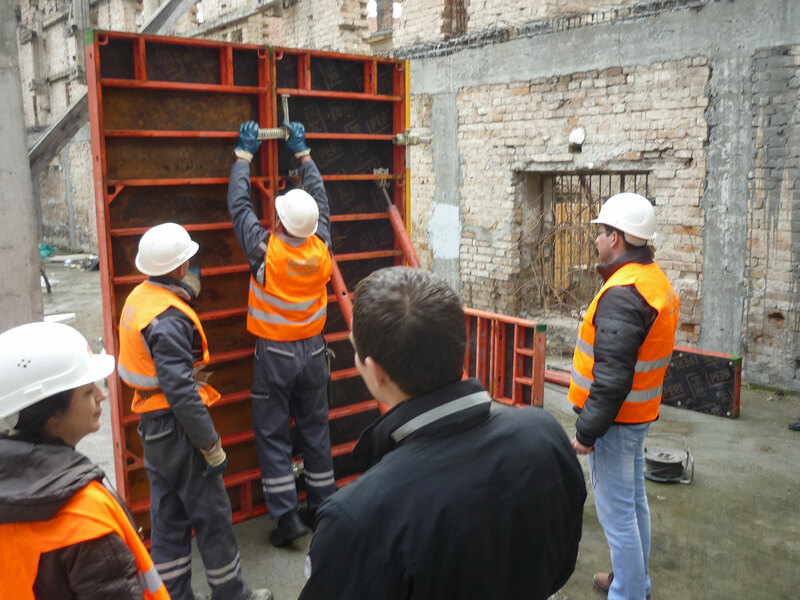 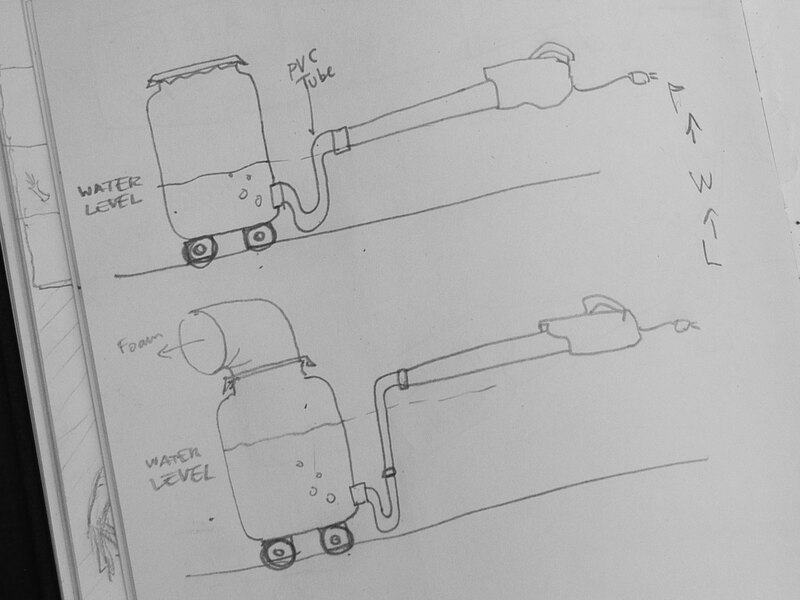 The central motifs of our investigation is openness and permeability. 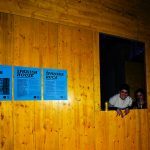 We took the residence in the Spanish House for three months, getting to know it and changing what we discover through our interventions, creating spaces that can be experienced again and again in new ways. 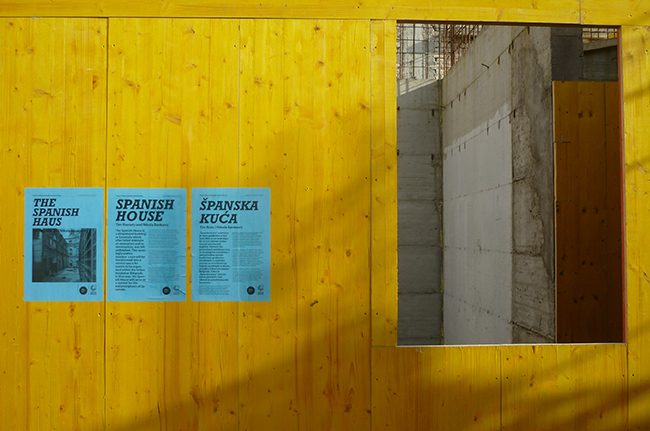 We were able to open the doors of the Spanish House on a daily basis and, because of that, succeeded to forge many new links. 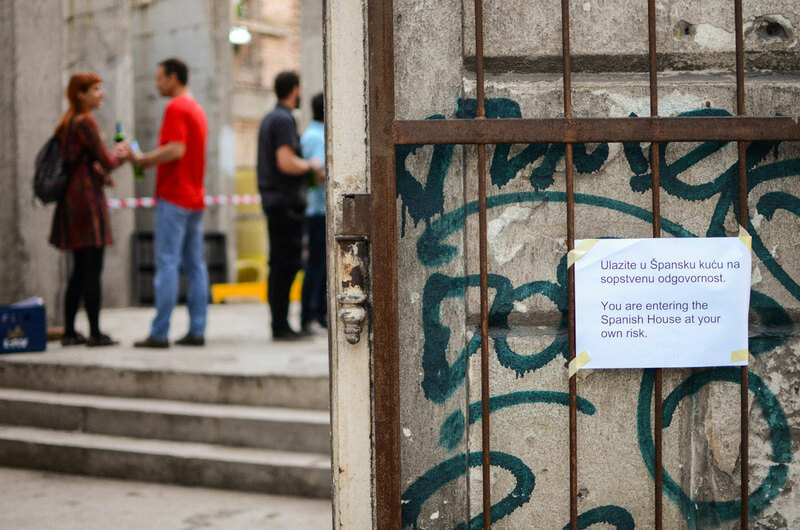 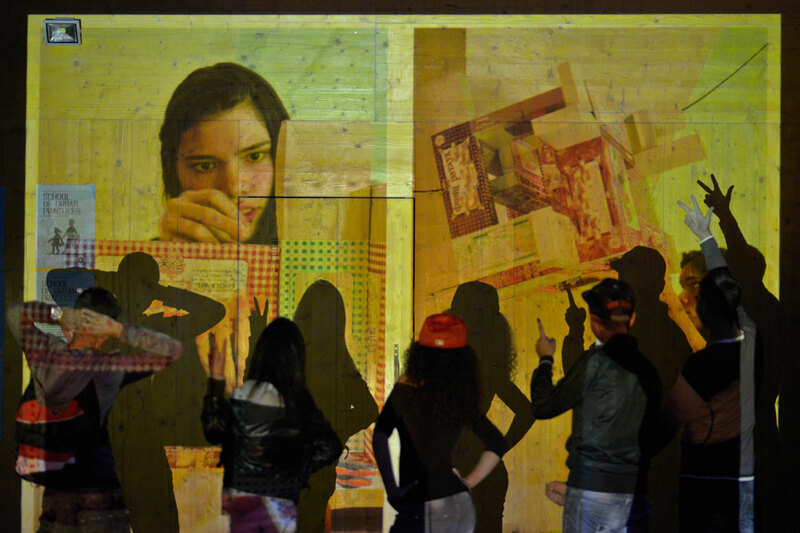 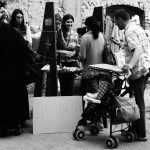 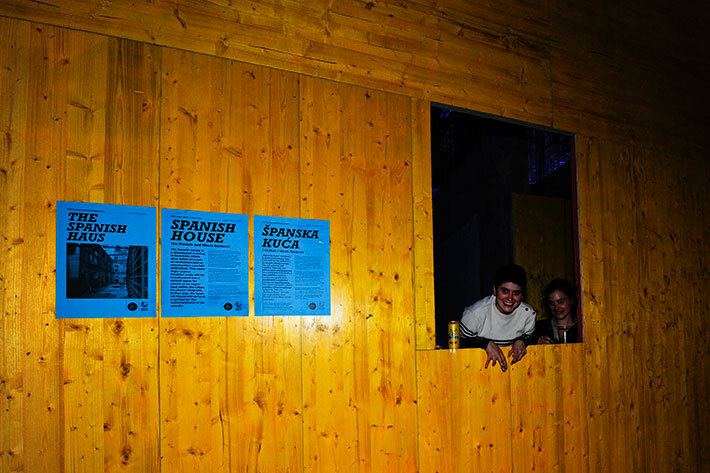 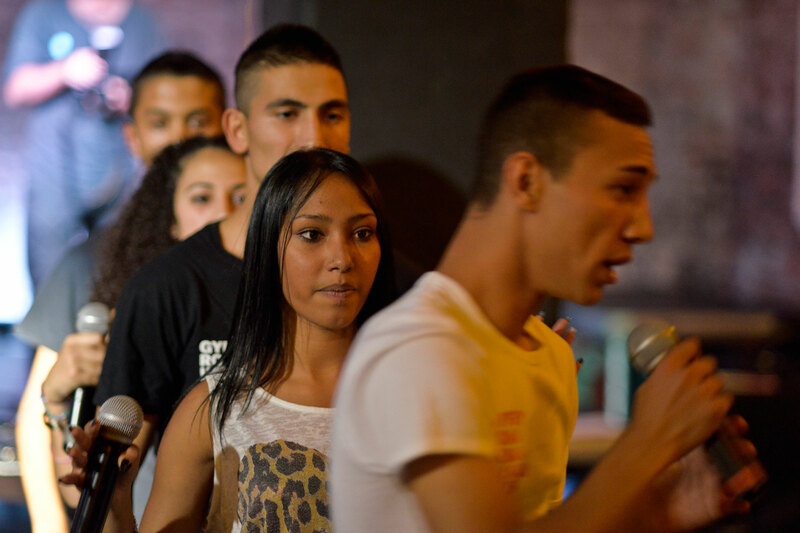 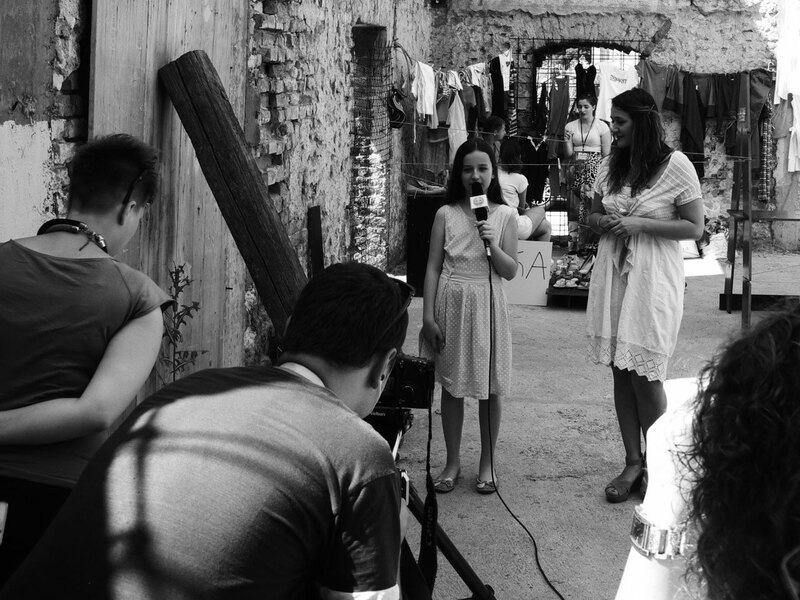 Also, we revived the Spanish House through open workshops, performances, exhibitions and markets. 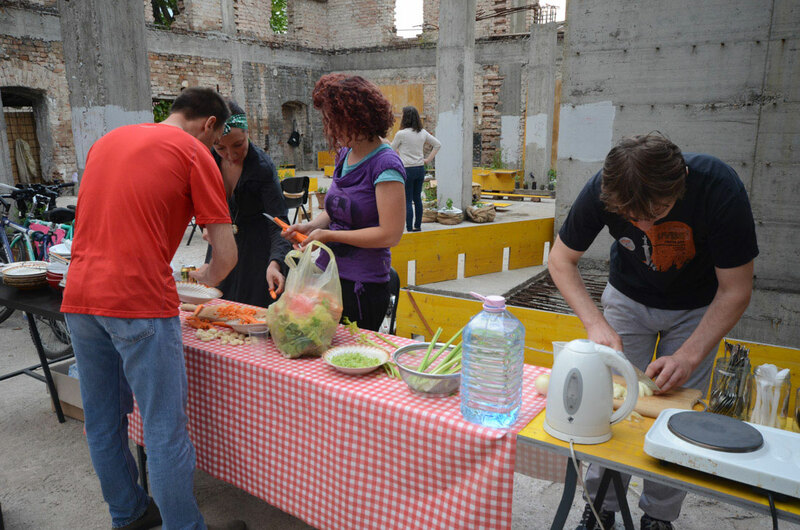 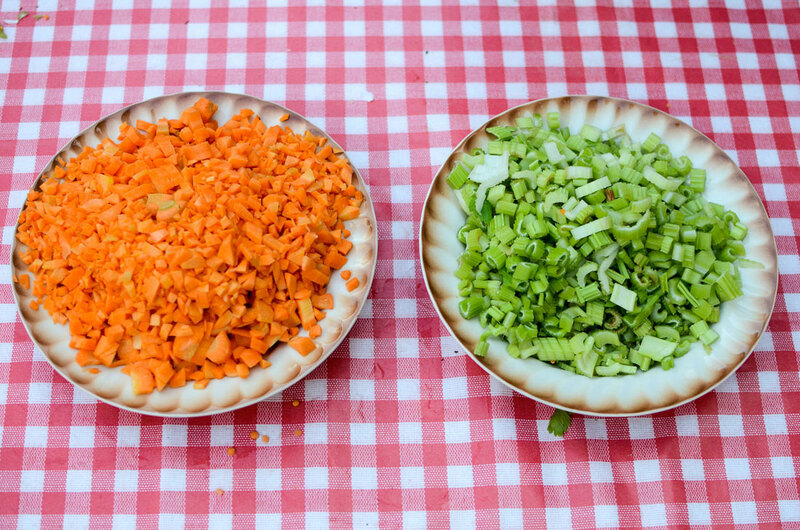 We cooked together with different communities and initiated discussions about the city, common space, and spatial problems. 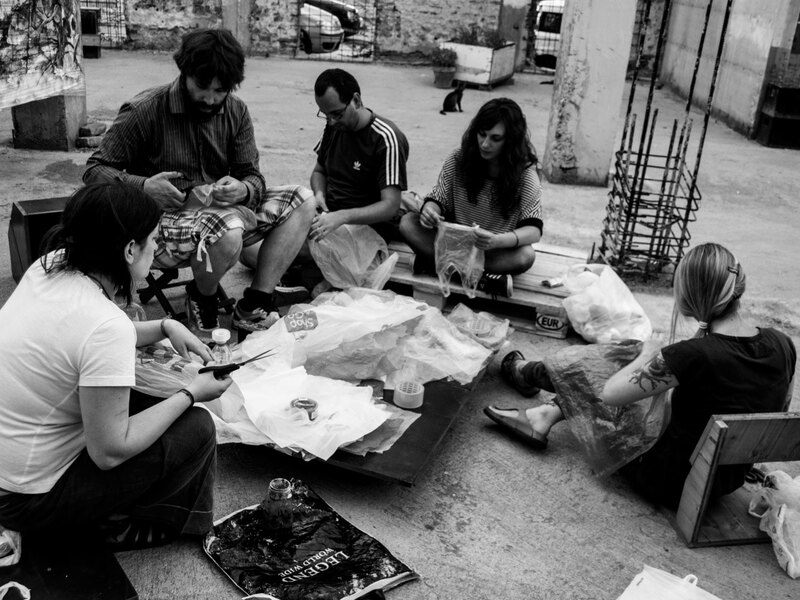 Working with an interdisciplinary team of students and experts from the fields of architecture, urban planning, landscape planning, electrical engineering and art, we functioned as a catalyst, providing an impetus for the development of the area through our experimental form of spatial transformation. 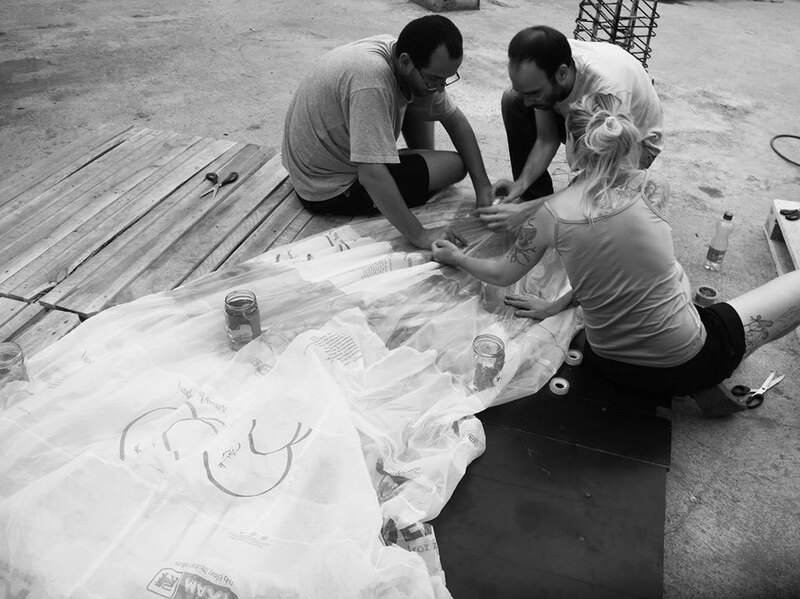 The project was largely shaped by the interdisciplinary of the team and the heterogeneity of participants’ interests in the city.